Maintaining control of kitchen supplies and surfaces is a must for those with food allergies. Yet, there are many times when a shared kitchen is all that is available. When is it safe to cook there? And how do you do it? When do you need to find an alternative method to prepare food? What are your limits when it comes to safety? When we were searching for a safe college living experience for our son, Morgan, who has allergies to peanuts, tree nuts, sesame, fish and shellfish, many colleges promoted their dorm floor “community kitchen” as an option for preparing safe foods. These kitchens allowed ALL students to cook brownies, pizza or whatever else might be hitting their palate at midnight when the cafeteria was closed. Most of the kitchens we saw were supplied with utensils, baking trays and various other kitchen gadgets to be able to cook and/or bake. Preparing meals for someone with food allergies, using the same utensils and pans that had previously been used to make brownies with walnuts for example, was not a cooking situation that would prove safe for Morgan without a large amount of cleaning surfaces and supplies first. And the potential for cross contact was very high in the cleaning up process, so we did not see this as a good solution. Also, these college community kitchens relied upon the students to clean up after themselves, or to clean up after the previous student’s cooking attempts. Custodians and maids are frequently hired by colleges to clean the community bathrooms, but rarely are they cleaning the community kitchens. We decided it was safer for Morgan, and it was his preference, to eat in the dorm cafeteria where cross contact could be monitored by the chef and employees. During his two years of living on campus at college he never prepared any food in a community kitchen. Once Morgan moved out of the dorms, he lived in an apartment with three other roommates. They had shared a very small kitchen. Morgan asked that none of his allergens be brought into the kitchen. Each of the four roommates had separate bedrooms, so he didn’t try to monitor what food they brought into their rooms. He just wanted to ensure that nothing was brought into the kitchen area. There was only one “oops” in the 9 months they lived together, and the roommate who brought in nuts cleaned up everything – pans, countertops, utensils, plates, and even threw out the sponge – to ensure that Morgan didn’t have any contact issues. During his senior year of college, Morgan moved into a house with two other roommates and kept this same request that none of his allergens be cooked in the kitchen. It worked well, and his roommates always honored his request. While studying abroad in England, Morgan had to request special accommodations for his living and dining situation. Students who came from other countries to the University of Lancaster were provided a dorm room with a shared community kitchen to ensure that they met more students at the school while preparing their meals. While that would have been nice, it wasn’t a situation that Morgan felt comfortable with. Students came from numerous countries, many of whom were accustomed to regularly eating the foods that Morgan was allergic to – especially nuts and sesame. Morgan had to provide arrangements with the Disability Services Office to have an “ensuite kitchen.” That resulted in him being the only person using the kitchen in his dorm room. The room was tiny and the stove only had two burners, plus there was no oven! But he made it work for the 10 weeks of the school quarter while he was there, grateful that he didn’t have to try to monitor all the variety of foods in a community kitchen. And he still met many students in his classes and in the dorm. Morgan traveled overseas before studying abroad during his junior year of college and stayed in a variety of Airbnb properties. He also travels a lot for work now staying in these properties. He has found that cleaning all of the cutting boards, utensils, and pans before using them to cook is a necessity. He has also stayed in Airbnb properties where the host will provide breakfast or some other meal. This gives him the opportunity to explain his food allergies, and he has never accepted food from someone else. He has stayed in a property where there were other “roommates” who used the kitchen. He was only in this situation for a week, and decided to not ask that all of the roommates refrain from bringing in his allergens. Instead, he cleaned the kitchen utensils that he was going to use for making oatmeal for breakfast, and ended up eating out for most other meals at safe restaurants. What we’ve found is that it’s most important to listen to your intuition about a situation AND always be honest about your food allergies. It’s never worth accepting a food from someone because you’re concerned you’re going to hurt the feelings of your Airbnb host. Bring plastic gloves to be able to do the cleanup in a kitchen without having any cross contact issues, or ask a friend to help. You might have to pay more money in order to get a safe living situation or a safe traveling situation – but your safety is worth it! When our son, Morgan, was young we were always SO careful to protect him from dogs and cats because of his severe allergies, diagnosed from a skin prick test, and confirmed with a few disastrous exposures. Prior to him receiving allergy shots, if he was in a house where a dog or cat had ever lived, his eyes would swell shut within 10 minutes. After receiving allergy shots, he wouldn’t have such a severe reaction, but was still subject to some asthma issues. A few weeks ago, my husband and I went to Winter Park, Colorado, to stay in a condo owned by his brother. We were told that the property is “pet free,” and that they don’t allow anyone to bring in pets, which was a welcome relief. We packed up for a 4 day/3 night stay looking forward to rest and relaxation in the beauty of the Colorado Rockies. When we got there, we noticed that there were dog hairs on the couch. We knew that his brother’s family owned a dog, and figured that the dog must have come to the condo with them at some point. I wasn’t too concerned since I have only ever had issues when the dog is in the room with me, and then only with a few dogs. We bought a lint roller at a local hardware store and gathered up all the dog hairs we could. I wasn’t having any of my traditional runny nose or cough, so I thought I was doing fine with the dog hairs. And the condo was basically clean, with no dog hairs on the carpet, so we proceeded to stay the entire weekend having a great time. I did notice while we were there, that during the night, around 3am, I kept waking up with an acid feeling and stomach ache. This isn’t unusual for me since I have a diagnosis of Eosinophilic Esophagitis (EoE), and I chalked it up to not taking enough acid medication. By the time we got home, I realized that more acid medication wasn’t helping to mitigate my symptoms, and that my EoE had really flared. In Winter Park, it was snowing the entire time we were there, so there were no pollens in the air, which is my usual trigger. The only thing that could have triggered an EoE flare was the dog hair! That was a new experience for me. I haven’t been in a house with dogs in several years, and it has been decades since I stayed overnight in a room where a dog has been. I now know that “pet free” to some people means that they don’t allow OTHER people to bring pets to their rental property. It doesn’t mean that they don’t bring their own pets! When we have booked a condo through AirBnB, I always inquire with the owner whether pets have EVER been in a property, yet with my own brother-in-law I neglected to do this. Unlike traveling to San Francisco, which I wrote about here, Mexico City had its challenges. 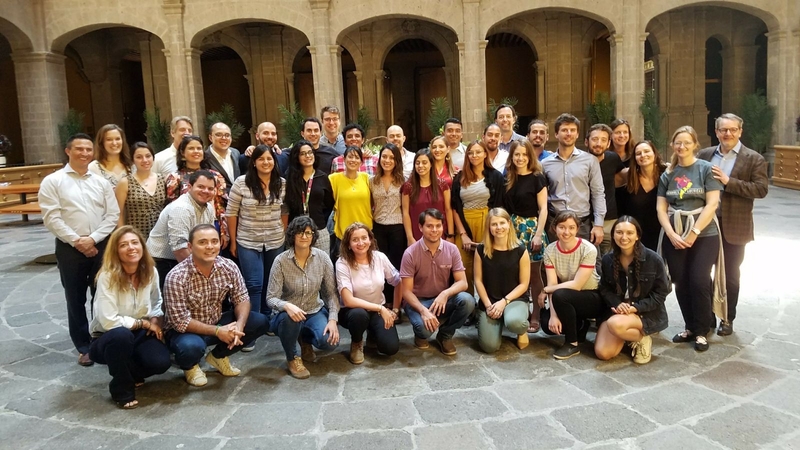 I was attending a conference in Mexico City called the Youth Congress for Sustainable Americas, which is organized by a non-profit organization based in Denver. I attended with some other students from the University of Denver, including Darylann who was the Vice President of the Student Body with me as President. We booked flights on United: it was either United or American Airlines and United’s policy for food allergies is much friendlier. They don’t serve any packaged nuts and I’ve flown United before. I can say I was apprehensive since United isn’t like Southwest, but I actually had zero problems on the flights to and from Mexico City. I had to fly through Houston, so it was a long period of travel each way, but I didn’t have much problem. This was also my first international trip since going abroad in Fall of 2016, so I was very excited! I brushed up on some key words in Spanish and tried to be as best prepared as possible. We arrived late on Thursday, April 5th and immediately took a taxi to our hotel near the airport. We immediately went to bed. The conference didn’t start until the evening on the Friday the 6th, so we spent the day around the city, mainly in Coyoacán (a borough of the city). We saw the Frida Kahlo Museum and some parts of the city. It was great! We then went to the conference, beginning with a dinner at a venue in the city (Hotel Carlota)! It was pretty hip venue. I must write and give huge thanks to the conference organizer, Robin. She made sure absolutely everything was safe. She’s also fluent in Spanish, so she could make sure with the service staff that all of it was safe. She was also managing other food restrictions like vegetarian, so she was super cognizant of it all. We had a delicious and safe dinner (I overheard the waiters talking about the “especial” meal for me, so I knew Robin had taken care of everything). The next day, the conference was in El Club de Banqueros, an event venue in the middle of the city. It was gorgeous! The conference had participants from across the Americas, so we had live translation between English, Spanish, and Portuguese. 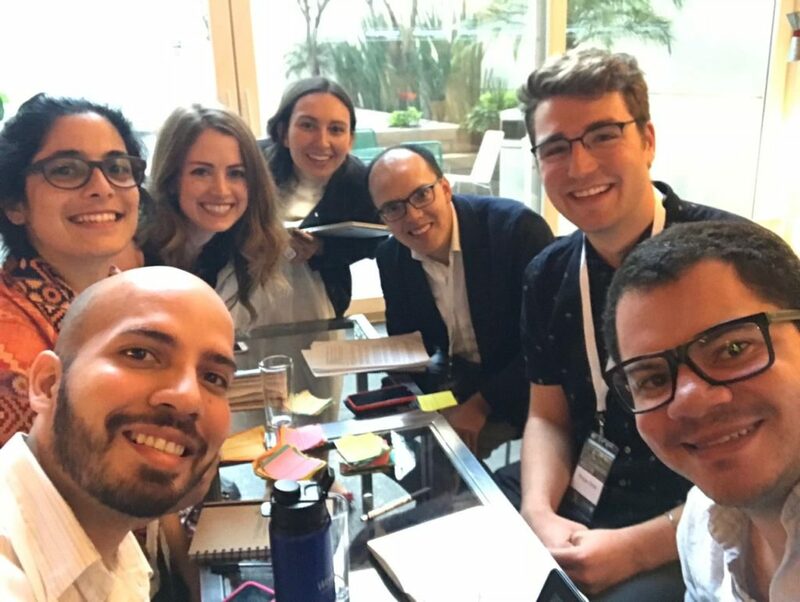 Mostly, the translation was for us Americans and Canadians who didn’t know Spanish – although most of the folks from Spanish-speaking countries had to use the earpieces for our Portuguese speakers! Robin was coordinating all of the food at the venue. She worked with the staff (in Spanish) to make sure I had safe meals. Truly, she was just tremendous. Some other conference attendees and myself! Folks from the US, Venezuela, Mexico, and more! The day was long, but we had an exhilarating dinner that night at a private art venue in the city with a local food crew. They were making tacos that changed my life. 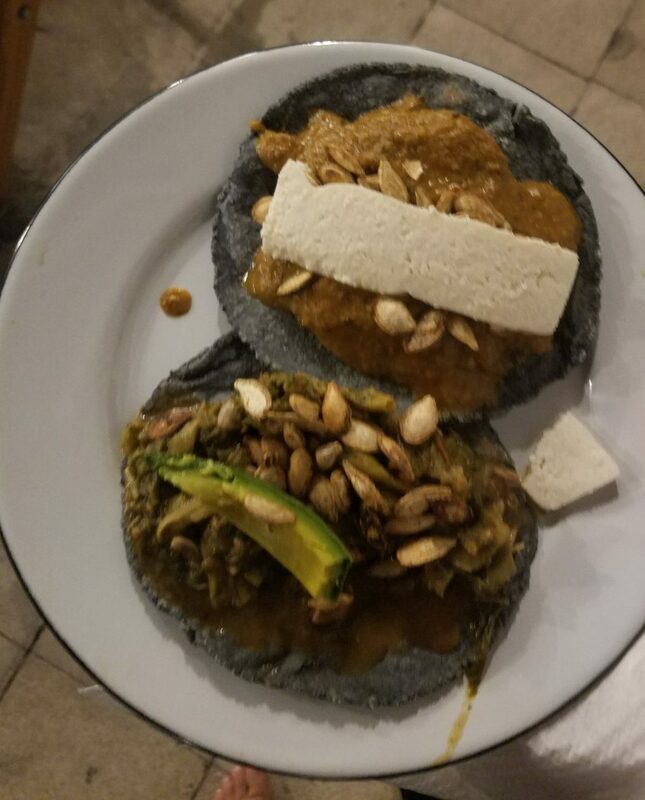 They were using all fresh, local ingredients and hand-pressing and heating the tortillas on-site. They made a variety of fillings. Robin helped check which of the fillings were safe with the food crew (again, Robin to the rescue!). I was able to enjoy some incredibly delicious tacos with fresh ingredients. We had one last day of the conference on Sunday, for the morning. After that, five of us from Denver (two staff from the non-profit and three of us from DU) went and adventured around Mexico City for the rest of the day. Darylann and I flew back together on Monday and resumed school! Now with the sequence of events established, let’s talk health challenges! First, the water. I was careful during the first 36 hours or so. Mexico City does not have great water and I knew that walking in to the weekend. I had bottled water and I knew not to just fill my refillable water bottle at any old water fountain. Then: the hotel we were staying at served (drip) coffee in the morning and while they said that the water they used was filtered, my stomach definitely disagreed. I threw up, recovered quickly, and continued on with the rest of my day. However, it wasn’t a pleasant experience. The venue we were at for the conference (El Club de Banqueros) actually filtered their water enough: they provided coffee throughout the day and my stomach agreed with that coffee. Lesson learned! I refused to get water or coffee from our hotel for the rest of our time in Mexico City. I exclusively bought bottled water and was much more conscientious about drinking water through the whole weekend. The second real issue was the smog and pollution. Denver is a pretty clean city so my mild asthma is rarely triggered, even during the springtime season. I’m not consistent with an inhaled steroid (Pulmicort) to help moderate the asthma, especially during the winter, because my lungs are just fine during that time of the year. This was an agreement reached with my doctor, so please talk with your doctor about the best practices to help control asthma if you have it. Anyway, with the spring season only just starting in Denver, I hadn’t really been on Pulmicort, but I brought it anyway, along with all of my other medications, just to have in case anything happened. I’m glad I did! The smog really activated some minor breathing problems the first day I was in Mexico City: essentially, it was just some tightness in the chest. I took Pulmicort regularly through the whole weekend and I didn’t have any further issues (the problems dissipated). Now, for the weirdest story of the trip! It was our last day and we were adventuring around the city. 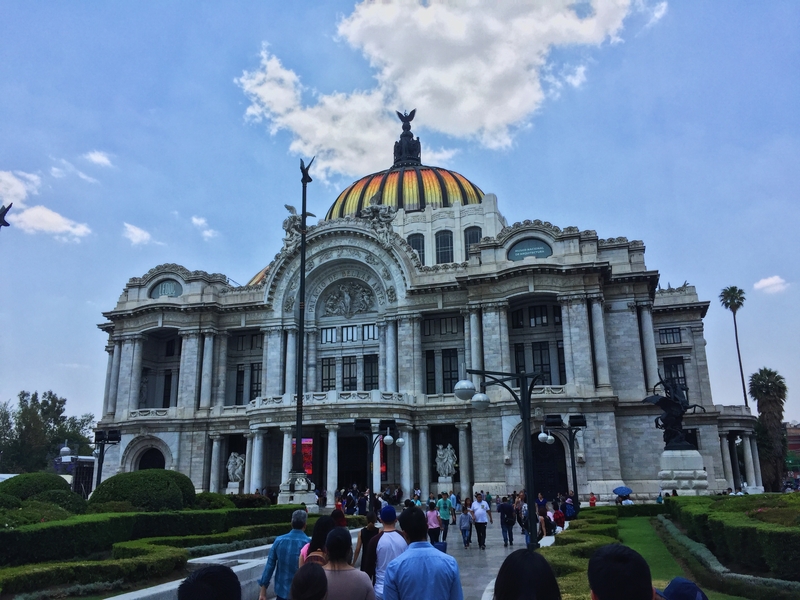 We went to the Palacio de Bellas Artes, a beautiful cultural center in the center of the city. There are gorgeous murals from artists and has some beautiful rotating galleries of contemporary art. Diego Rivera has a very famous mural installed at the Palacio – and after seeing the Frida Kahlo house, I definitely wanted to see some of his art! Everything was going fine for the first fifteen minutes: we dropped off our bags and began wandering around the gallery. Slowly, my skin became red. It wasn’t blotchy or full of hives either: it just gradually became redder in color. My eyes swelled up and my face turned a nice hue of red as well. My skin was not itchy at all, but my eyes definitely hurt. I had no idea what was going on!! My companions were all very concerned and pointed out my very red skin. I looked like a very sunburned American walking around with very red eyes. However, I had absolutely zero breathing problems and nothing else was happening besides my skin and eyes being very red. Nothing even itched! Such a weird, weird thing. Anyway, I was wondering if it was something I had eaten for lunch (a delayed reaction, nonetheless, because I had eaten over an hour prior). However, once we grabbed our things and stepped out of the building, I took a Benadryl and my symptoms disappeared within the next fifteen minutes. I still have absolutely no clue what happened, but I’m glad I don’t look like a red alien! If any of those symptoms became progressively worse, or if I had breathing problems, I would’ve immediately asked one of my friends to call emergency services and administer an autoinjector. That would not have been an ideal situation, but it would have been medically necessary. Other than those three things, the trip was great! Robin was such a huge help in making sure my food was safe for the duration of my trip (she even helped order a dinner at a restaurant our final night there). The whole experience was amazing, and I loved the city so much! I also loved all of the people I got to meet at the conference and had such a blast. I wish I could’ve stayed even longer, but I had to get back to school. If you’re looking for more information about traveling with food allergies in general, you should click here. If you’re looking for more information about traveling internationally, you should click here. I’ve had a blast traveling over the past two months and I can’t wait to graduate from college! Happy travels, all! 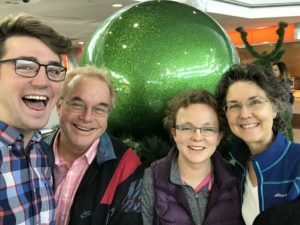 Traveling with Food Allergies and Friends to San Francisco! Over the past two months, I’ve made two incredible trips: one to San Francisco for over a week and one to Mexico City, Mexico (read about that trip here) for four days. It’s rather a busy time for me at the moment (I’m graduating from college in literally two weeks!) so I’ve been meaning to write this post for a while. I figured I’d finally get around to it! I went to San Francisco with my two best friends, Thomas and DK. We traveled Europe together and currently live together, so we know each other’s travel rhythms and they are both well acquainted with my food allergies (peanuts, tree nuts, sesame, fish and shellfish), allergic reactions and how to administer my Auvi-Q. We planned on staying in San Francisco during Spring Break from Friday to the following Sunday (a little over a week). Thomas’ aunt and uncle live in San Francisco and they offered that we stay with them! They didn’t have any dogs or cats, which would have been a deal-breaker for over a week’s stay: I don’t have problems with most dogs or cats for a short period of time due to allergy shots, but over a longer stay I wanted to minimize problems. We affectionately called this trip “Dadcation 2k18” because we joke we’re all a bit like dads. 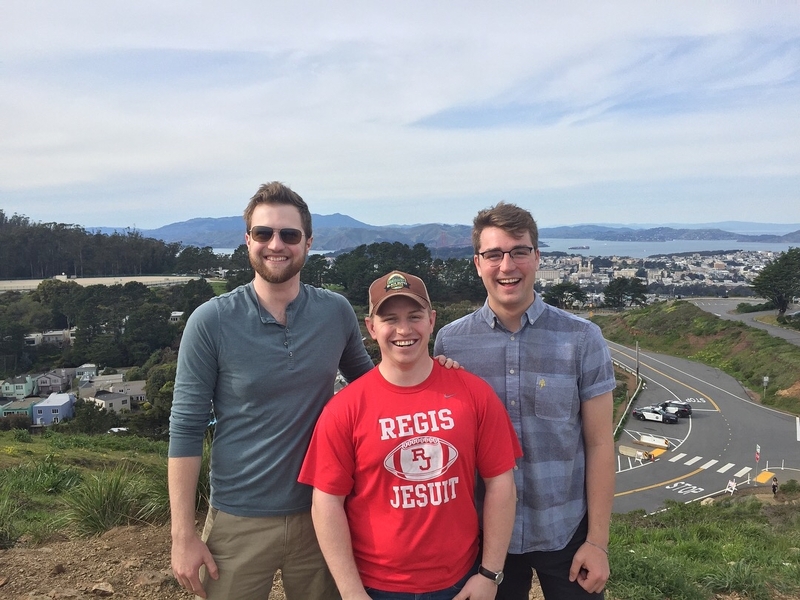 When initially planning, DK believed he was going to be out in San Francisco before we were for a spiritual retreat (he’s planning to be a Catholic diocesan priest). 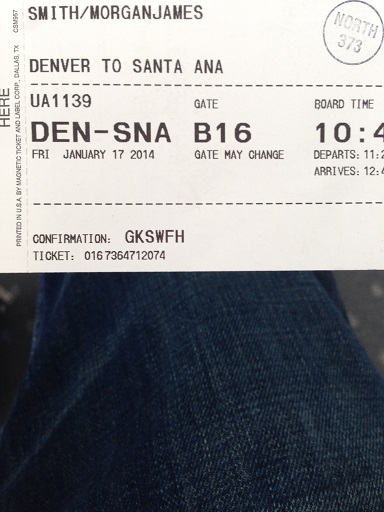 In the end, the retreat was moved so DK merely booked separate flights. Thomas and I, however, decided to fly Virgin America! It was incredibly cheap ($200 roundtrip versus at least $350 on other airlines) when we were booking flights a couple months out. I double checked their food allergy policy and everything was going to work out just fine! They didn’t serve any peanuts and while I couldn’t get a pre-board, I knew I’d just carry along some sanitary wipes and clean off the seat I was going to sit at. Note: As of late April 2018, after I flew Virgin America, the airline has been fully integrated into Alaska Airlines. Alaska does have a pre-board option, unlike Virgin. I try to stick with safe airlines (Southwest being the gold standard), but we were very price conscious since we knew San Francisco was going to be expensive. I felt comfortable with my choice and I had absolutely zero issues with the flight! 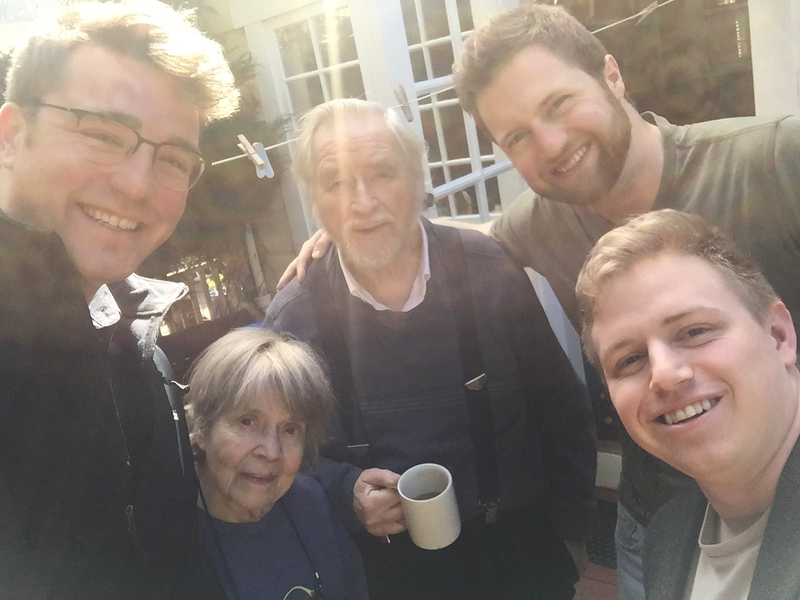 We took a short Lyft into the city and met Thomas’ aunt and uncle, Mike and Bette. They were absolutely extraordinary hosts and truly loving, wonderful people. We arrived around 8pm and decided to go for a late dinner at a local pizzeria. I immediately fell into the casual rhythm of travel: go with the flow, deal with any issues as they arise, and make sure I always have a safe option. Pizza felt like a good choice, too, since it’s usually not too crazy. It was more of a craft Italian restaurant, so the meal was delicious and I merely asked the waitress to make sure that the pizza was made safely to keep me safe! Worked great. Since Thomas and I literally had just finished finals (we’re on the quarter system at the University of Denver), we decided to take the first couple of days pretty easy. We slept in, hung around Mike & Bette’s place, and just enjoyed the area. Mike and Bette had asked if we wanted any food around the place and Thomas had merely requested breakfast food so we could go out and experience the city in during the day and eat as we pleased. They provided so much food. In all honesty, I have no idea whether Thomas informed them of my food allergies. He’s very cognizant of my food allergies after living together for 3 of 4 years in college. Nonetheless, all of the food Mike and Bette purchased was safe. Of course, breakfast food for us was eggs, sausage, fruit, and vegetables so it was pretty hard to find something unsafe. Over the course of the next week, we walked around most major parts of the city. We also purchased a week pass for the transit system (the Muni). We walked along the entire Embarcadero and the whole pier, saw Chinatown, went to Alcatraz on a night tour, saw two incredible cathedrals, participated in a civic protest, and enjoyed nights on the pier and in Noe Valley. We ate wondrous food, saw incredible parts of the city, and stayed in on some rainy days. It was a truly fabulous week. I want to highlight a couple of events that I did not anticipate. On one day, when we were walking down the Embarcadero, we ended up on the far north side in Ghirardelli Square. Technically, that’s up in Fisherman’s Wharf (an area of the city). My general rule with any chocolate is not to eat it unless I have called and made sure the production process is safe since so much chocolate nowadays includes nuts of some kind. Ghirardelli is not safe for me: some explicitly contain nuts and everything else has a “may contain” or “made in a factory” warning. Nonetheless, we entered into their shop and I mildly perused their offerings, just seeing what was around. Thomas and DK were superbly excited because they love chocolate and Ghirardelli. I waited around while they got a milkshake and purchased a couple gifts. Obviously, I couldn’t purchase or eat anything. I can’t say I was disappointed about this adventure, because travel is a push & pull between what different people want to see or not. Thomas was all about Ghirardelli. I had a similar experience down on Fisherman’s Wharf walking past Boudin Bakery and some of the local seafood shops. Boudin produces world-famous sourdough bread but it wasn’t particularly safe (due to cross contact) and obviously the local seafood wasn’t safe for me. I wasn’t going to get a bowl of clam chowder with the boys, so we went elsewhere that night (we ventured back to a safe burger place in Noe Valley). I had to make sure I had safe food and DK & Thomas were very accommodating. However, I wasn’t going to let DK and Thomas leave San Francisco without letting them try their seafood. I knew they wanted to eat some of it. So, we made a night where I would see a friend who was in the city (her name is Melissa) and they would go with Mike & Bette to a delicious seafood place. This worked great! I met Melissa in the Mission and ate some wondrous Cancun-style tacos and they ate seafood. This was essentially how we accommodated each other during our Europe trip: I would make sure I could find safe food and then the boys would be able to eat whatever they pleased. Mike also took us to his club (it’s at the Presidio Golf Course). Very, very nice! We met up with two University of Denver alumni who live in the city with whom Mike & Bette are friends. We ate a late lunch as a group and I double-checked with the servers that the food would be safe (it was). I ate some short-ribs and had a lovely discussion. However, that afternoon was pretty unplanned: we had absolutely no idea where we were going that evening. Me, Bette, Mike, Thomas, and DK on our last morning in San Francisco! As it turns out, we wandered around the Presidio and the area: there is an old military base and some beautiful green lands in the area. We took our time and savored the day. We then walked along the beach all the way back down to Fisherman’s Wharf. By this time, I was getting pretty hungry for dinner: the good news being I remembered there was an In-n-Out at the Wharf that I spied when we were at Ghirardelli earlier in the week. I suggested In-n-Out to the boys and they are 100% on board. It worked out fabulously! In-n-Out is a great safe burger place for me, but I definitely double checked that everything was still safe before paying. San Francisco was an incredible city and it was so much fun! I am so grateful to Bette and Mike for their hospitality and generosity. It was an amazing week and I will forever cherish that time. I had zero issues during the whole trip and I just can’t speak highly enough of the city and our time. As a part of its study abroad program, The University of Denver (DU), where I attend, offers membership to a service called International SOS. International SOS offers consultation on health and security for individuals traveling abroad. This service was incredibly helpful to me while planning out for study abroad. All DU students are required to have at least one consultation with International SOS (over the phone) before they leave. I called up International SOS and spoke with two individuals. The first individual was a security and travel expert and she briefed me on the ongoing security situation in all of the countries I was planning on visiting. She gave me a debrief on ongoing developments regarding terrorism and personal safety, as well as general practices as a US citizen abroad. This was great and very useful. The second individual was a medical doctor. He was incredibly helpful. He had the medical knowledge required to understand my food allergies and the international experience to understand how they could be best managed while I traveled. He made sure I knew how to manage cross contact and how to be careful while purchasing food at restaurants while traveling (a skill I was well versed in!). He noted that I would be unable to fill a prescription from an American doctor while traveling in other countries; instead, he recommended that I travel with my medicine in their original boxes that have the prescription on them. 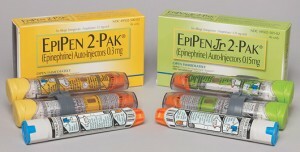 As such, I planned on carrying all of my medicine, including an extra set of EpiPens, in their original box. If I needed to get a refill of a certain medicine, I could at least present the doctor in the foreign country my original prescription box to obtain a prescription that would be filled at the local pharmacy. Since different countries set-up their health care systems differently, an American prescription wouldn’t be able to be filled at a foreign pharmacy. He did not believe there was any required paperwork to carry my medicine (EpiPens, antihistamines, asthma control, etc.) in the countries I was visiting. He recommended that, if it made me feel more comfortable traveling with a doctor’s letter that allowed me to carry my medicine, then I should obtain one. I did. The US Department of State also offers a service called STEP (Smart Traveler Enrollment Program) that pushes updates to your email on ongoing security alerts in the regions you are traveling in. This also allows the US government to identify that you are in a country in case something happens and get you help. I also enrolled in STEP for my entire time abroad. Not every school offers a service like International SOS. I think that finding a good resource online is possible. You should conduct thorough research on the countries you are visiting and the rules for bringing in medication. Countries usually have websites that detail these rules. Moreover, you should talk with your doctor about what is necessary to manage your medical conditions. 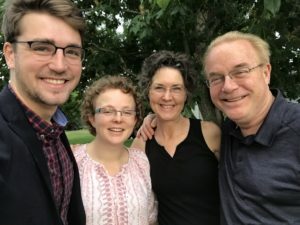 For the first time in 14 years, our family took a week long vacation with just the 4 of us: my husband, me and our two grown children – Morgan (almost 22 years old) and Michaela (27 years old). 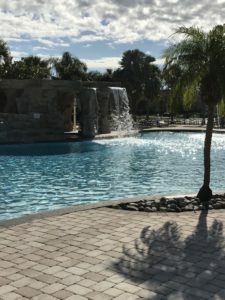 We headed to Orlando, Florida for a week’s worth of fun and sun in December. With Morgan on the quarter system for college, and Michaela already working, this was an ideal time to vacation during “low season”. We flew Southwest Airlines on a non-stop flight from Denver to Orlando. Southwest has worked great for all of us in the past, and has allowed Morgan to preboard and wipe down his area. Traveling to Florida, we were on a brand new plane which was on its first day of flight, which was wonderful! That flight and the flight home worked perfectly – both were mid-morning flights, so not the first flight of the day, but we’ve never required that as part of our travel plans. When we boarded the flight home, the flight attendant told us that the previous flight also had no peanuts served, which made for a nice, clean plane. But we still wiped down the area where Morgan sat. 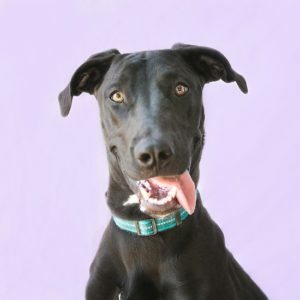 Traveling and managing Morgan’s food allergies – peanuts, tree nuts, sesame, fish and shellfish – along with his pet and environmental allergies pales in comparison to managing Michaela’s and my mast cell symptoms. She and I both eat only organic foods; however, her diet is vegetables and fruits, while I tolerate only a few foods – chicken breast, turkey breast, frozen Cascadian Farms hash browns and broccoli. My husband, Robert, is on the Whole 30 food plan – so cooking for all of us requires a short order chef! Actually, we don’t ever eat out because of the organic food requirement, and the mast cell issues require much more vigilance than even food allergies. The type of water that I drink can affect my stomach! Unbelievable, but true. And for those of you with mast cell issues, I’m sure you know what I mean. So, braving a family vacation is a big deal. It also requires a lot of patience on each person’s part since each of us has different needs depending upon the situation. We’ve learned to also have activity days and rest days to keep positive attitudes! We rented an AirBnB house that guaranteed it was pet and smoke free, and had a full kitchen since we would be cooking every meal. We planned ahead by finding out where the local grocery store (Publix) was, and I special ordered from them a week’s worth of the frozen potatoes that I eat. We also found a Whole Foods for Michaela’s foods, although it was 30 minutes from where we were staying. Morgan and Robert purchased their foods from each of these stores also. The pool area in the community center where our AirBnB was located. I didn’t bring the organic ground turkey that I usually eat because I had called ahead to Publix and Whole Foods to ensure that they would carry it – plain with no spices added. However, when we arrived neither actually carried it, despite their reassurances that they did. This created a search across Orlando to find such a product. We finally did find a different brand, but I learned to bring it in the future since it’s so difficult to find elsewhere! In regard to bringing food, we got a letter from our allergist to allow us to bring food onboard the plane through TSA. This letter was never requested, but we had it just in case it was. Also, the allergist’s letter delineated that we would be bringing frozen food in a cooler and checking it through as baggage. This too worked just fine with Southwest Airlines, and they never requested the doctor’s letter. We found that the home we stayed in wasn’t well equipped with kitchen supplies, so thankfully I had brought a few frying pans and lids in my luggage. I always bring my own yellow colored spatula so that even my family knows which spatula is mine! I also brought my Instant Pot in my luggage. Since Michaela and I are part of Dr. Li’s private practice of Chinese Herbs for Allergies, Dr. Li has asked that I only eat meat cooked in the Instant Pot to help my stomach heal, and purchasing another one in Orlando didn’t make sense. So we brought a second suitcase with all these kitchen supplies! All the grocery shopping and driving took us half of the first day in Orlando to set ourselves up. Then the fun began! 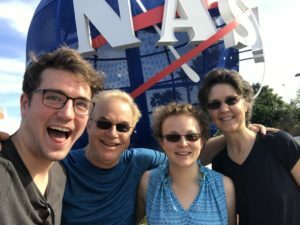 We went to the Kennedy Space Center and Cape Canaveral for our first outing. We packed our lunches and left them in a cooler in the car while we visited the Cape. We neglected to call ahead to see if a microwave would be available, and later we were told it wasn’t. In fact, they wouldn’t even allow any outside food in the space center, even with a medical condition from what we were told. So we ate our lunch cold (cold potatoes, broccoli and chicken will fill up the stomach, but doesn’t make a tasty meal!) in the car. Not the ideal situation, but we enjoyed each other’s company. And with my husband being a space enthusiast, we had a great time seeing all the exhibits. We headed down to Cocoa Beach that same day. Being from Colorado, getting to see the ocean is a big deal. We enjoyed it thoroughly, especially since it is “low season” and there was hardly anyone else there, despite what we would call hot weather in December – mid-70’s! 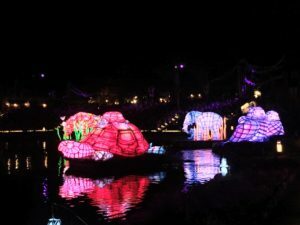 The next day, we went to Disney Animal Kingdom. 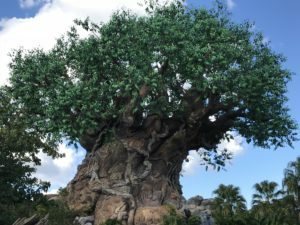 We wanted to especially see the new Pandora – World of Avatar, and to visit the Tree of Life. Michaela and I had to pre-make our meals the night before so that we would just have to heat them in the park. Morgan and Robert were able to bring salads and sandwiches – no heating required! We searched online and found that they have lockers near the opening gate, which is where we put all of our lunchboxes plus snacks. Thanks to an inquiry on my AllergicChild Facebook page, I found out that the park does have one microwave for the public in the Baby Center area. 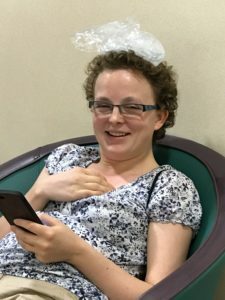 The park doesn’t have a lot of air conditioned locations, and with the temperature in the lower 80’s plus the humidity, our daughter began to have heat issues. You may remember me blogging about this issue here when she ended up hospitalized after having two grand mal seizures. Thankfully, right next to the Baby Center, there was a First Aid office. She was able to get a bag of ice and sit in air conditioning for a little while to cool off. Twice more during the day, she went to First Aid to get more ice. I can’t say enough nice things about the Disney employees in First Aid – they were just magnificent. Each time she would come in, they provided a large plastic baggie of ice, and remembered her name from the first time. They treated her with such kindness, and we were so grateful for that. Since the lockers we chose were at the park entrance, and the baby center was in the center, Michaela would walk with her plate of food piled high with cauliflower, carrots and squash nibbling until she got to the microwave. Several times, we had people stop us asking where she got her food! Dozens of people in the locker area brought their own food. Disney asked no questions about the coolers or even the water I brought in, which was wonderful. 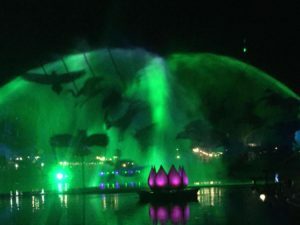 The day was really long since we stayed for the River of Lights nighttime show, but it was well worth it. We had all walked miles, and with feet hurting, we headed back to our AirBnB ready for bed! 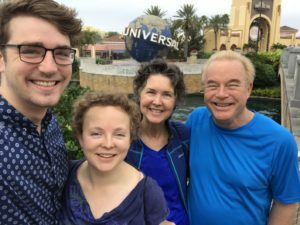 We took a rest day the next day, and Michaela and I headed out to visit a Network Spinal Analysis chiropractor in the Orlando area. These doctors are specifically trained in a type of chiropractic work that involves gentle, precise touch to the spine cuing the brain to create new wellness promoting strategies. We’ve found that part of the mast cell symptoms is extreme back pain, and all the walking we did the previous day was wreaking havoc on our spines. 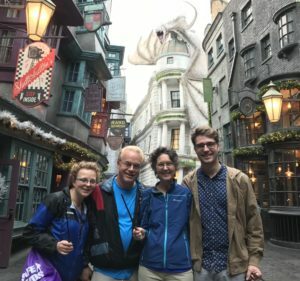 We found a lovely young woman who had recently opened her practice, and got us aligned and ready to walk the next day at Universal Studios Wizarding World of Harry Potter! This was the big event that we were most looking forward to. Universal also had no issue with us bringing food into the park. And I brought my own water without anyone asking anything about it. The lockers were once again near the opening gate of the park, however this time the microwave was very close in a “nursing room” in the family center. We decided to purchase the 2-park pass since Hogsmeade is in one park, and Diagon Alley in another. My husband owns a marketing consulting firm, and he declared that as good marketing! And, of course, much more costly, but well worth it. The weather was much cooler on this day (mid-60’s), and foggy which made for a great day to visit the magical world of London, feeling it was somewhat realistic to their actual weather. We next went to Diagon Alley where Morgan got to taste his first Butter Beer. 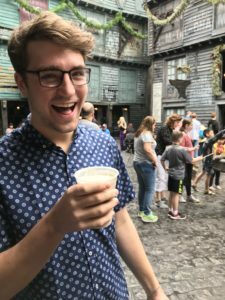 Tasting Butter Beer for the first time! Hi, in Universal Studios, we have fruit stands in the parks with apples, oranges, grapes, watermelon on them. Also have lemon and strawberry slush carts which will be ok, also have turkey legs on carts that are just smoke plain. We have a full service unit it is Lombard’s landing and Finnegan’s, we have a chef in each unit have the server bring the chef to the table and he can go over all the things he can do for you In Islands of Adventure we have 2 full service units one called Confisco’s and one is Mytho’s, we have Chefs in both of those units, have server bring Chef to table and he can go over the things he can do for you, we have another walk up unit it is Thunder Falls, we have smoke chicken, smoke pork ribs, and roasted corn on cob and roasted potatoes with fresh herbs and salt and pepper, also have French fries all natural cooked in soy blend oil that is the only thing cooked in those fryers too. I will also say no desserts at all from any of the restaurants too. We also have three broomsticks which have smoked chicken and smoked pork ribs, roasted corn on cob, baked potatoes, roasted potatoes with onions, garlic, salt and pepper, and fresh herbs and some salads too. If you need any more information or help feel free to give me a call at 321-388-2123, Chef Bob. We never purchased any food product in the park, but it was lovely to have all this information if we did. 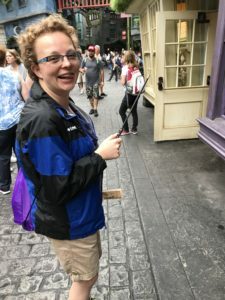 There was a lot of fish and chips on the menus in both Diagon Alley and Hogsmeade, but obviously there would have been safe food items if Morgan had wanted to eat. There were several shops with candies and sweets in them. 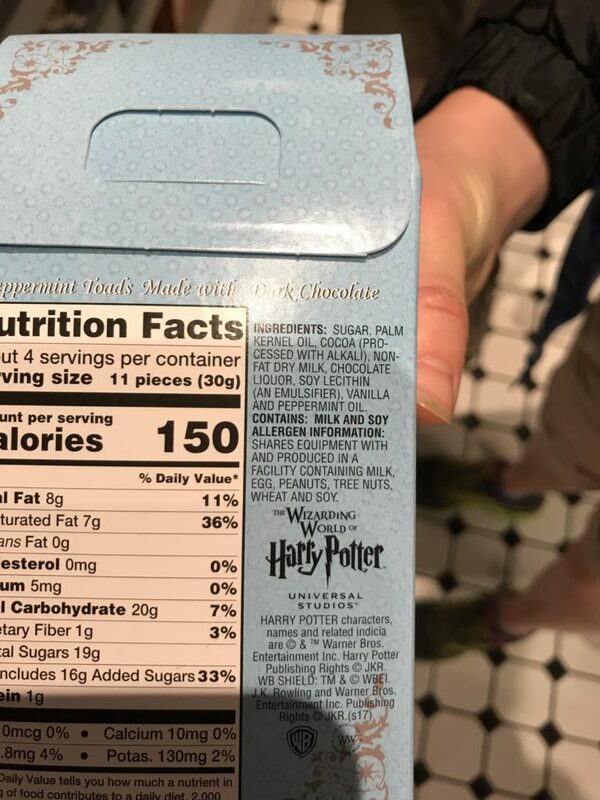 This is the ingredient label on the back of Chocolate Frogs which states, “Contains Milk and Soy. Allergen information: Shares Equipment With and Produced in a Facility Containing Milk, Egg, Peanuts, Tree Nuts, Wheat and Soy.” We didn’t find one candy that didn’t have this labeling. The candies were great for gifts, but not safe for Morgan to eat. The Wizarding World overall was superb. If you go, you have to purchase a wand! There is a map of all the locations where the wand will work it’s magic…I’ll leave it at that because that’s part of the fun figuring out how to create the magic! There were rides and shops throughout both parks, and once again we walked until our feet swelled! We road the train, the Hogwarts Express, in between the two parks. The next day was a rest day to pack up and get ready to fly home. We realized that we had cooked 21 meals on the 4-burner stove in the Air BnB kitchen, and no one went hungry! If your family is like ours, and doesn’t or can’t eat out, it’s still possible to have a wonderful vacation and cook every meal yourself. With a lot of pre-planning and preparation, we had the most wonderful, magical vacation! I had a really unique opportunity last week. 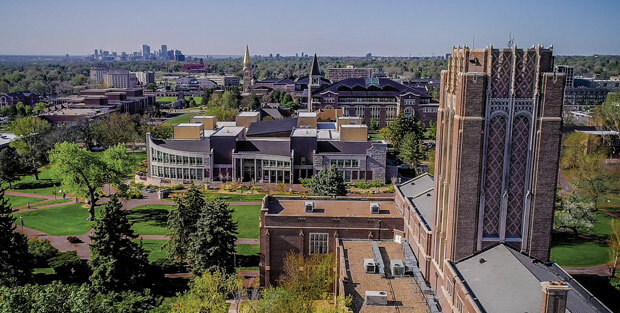 As the Student Body President at the University of Denver (DU), I get invited to events and special functions all the time – but this time was particularly special. The Broadway musical Rent was visiting Denver and our Vice Chancellor of Advancement at DU (his name is Armin) invited myself, the Student Body Vice President, and two of our student government representatives to go out to dinner with him and his husband and then see the play! Armin is essentially in charge of fundraising for our university, so this was quite an honor. We began coordinating a dinner place over email. While the Vice President (Darylann) and I had previously had lunch with Armin, I had no expectation that he would remember my food allergies. He first offered a spicy Chinese restaurant in the area. I counter-offered with two local restaurants I knew would be safe (and not incredibly expensive either). Armin tried to reserve a table at either of those restaurants, but they were all booked up. Instead, he hired a private chef. I can say with absolute certainty, I’ve never had an experience quite like this. A private chef? At Armin’s fancy place in downtown Denver? And then a Broadway show?? I was completely blown away. Armin asked us to all send along our food allergies or other requirements so the chef could adequately prepare food. One of the student government representatives, Jake, has Celiac Disease. Darylann has gastrointestinal issues that prevent her from consuming dairy. And I have my own food allergies to peanuts, tree nuts, sesame, shellfish, and fish. (The other rep, Scott, doesn’t have any intolerances or allergies). Darylann, Jake, and I all were joking the chef was just going to serve us a bowl of rice and call it quits!! We underestimated the chef’s ability severely. The chef, Megan, was incredible. She prepared a four-part meal: a salad with vinaigrette and watermelon beets, a sautéed butternut squash with spicy vinaigrette and yogurt, baked chicken breast with mushrooms and a delicious creamy sauce, and cherry meringue kisses for dessert. It was all 100% safe. She double checked all of the ingredients, prepared Darylann’s dinner without the yogurt and cream sauce, and accommodated all of my allergies perfectly. It was incredible. She was completely at ease accommodating all of our food allergies and intolerances and double checked with all of us. The show afterward was fun too!! I was still shaking in my boots by how awesome (and delicious) the dinner was and how successful the chef was in accommodating all of our allergies and intolerances. This just goes to show that multiple different food allergies can and will be accommodated in a professional setting with a caveat – make sure to speak up about your needs! This was an exquisite experience! 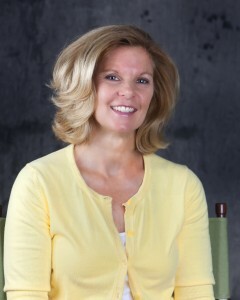 Betsy Craig and her husband, Rocky, started AllerTrain, an ANSI accredited food allergy and gluten-free training course offered by MenuTrinfo (which, according to their website is “dedicated to bettering the food-service industry by providing two major services: Certified Nutritionals and food allergy/ gluten-free identification and education”.) The course teaches foodservice professionals about the top foods causing food allergies, proper protocol for preparing food so to avoid cross-contact and to how better serve diners with special dietary needs. This will help restaurants avoid food allergy related incidents, and prepare them to handle such incidents, should they occur. Where did the idea of AllerTrain originate and how long have you been in business? AllerTrain was born out of my original business MenuTrinfo (mash-up of the words menu – nutrition – information). Once we set up our company nutritional software for industry in 2010 my husband realized he could tag allergens in menu items for the restaurants we provide nutritional service for. I knew that in order for it to help those with food allergies, and this new movement of gluten-free, that training needed to be in place to make a difference. Having food allergy friendly food was only step one in keeping diners safe and meeting special dietary needs. I reached out to others in the food safety, restaurant, food nutrition, and training space to begin to build a training program I called AllerTrain. This was October 2010. Can you explain AllerSTAR and MenuTrinfo? AllerSTAR takes learning objectives taught in the AllerTrain educational programs and makes them singular training points taught through a monthly poster and toolkit program. This is to enhance the learning in AllerTrain and also to keep the topics of food allergies, gluten free and proper standard operating procedures on top of mind. This poster training program is for all employed at a restaurant or college who does the month AllerSTAR program. Teach, test and sign off on the learning object creates ownership with the industry and staff at any food location that takes part in AllerSTAR. I’ve seen that you’re training many chefs in colleges who have Sodexo. What other groups are you training? Sodexo was a clear, eager and super helpful early adopter partner for AllerTrain but we have many folks who have trained within AllerTrain courses. Folks at almost all Ivy League schools, key brands like Eat’n Park in PA, Glory Days Grill in the New England area, a part division of Panera Bread in TN, WV and VA, Cattlemen’s Steakhouse in CA, universities and colleges throughout the US (in the FARE college training program and out). College food service management companies like Parkhurst, Culinart, Aramark, and Chartwells. Many different private schools, a number of public K-12 districts, hundreds of schools in Texas, Training centers throughout the country, Amtrak, over 300 health officials in Virginia, over 75 food service professionals that work within the federal prison system, Food service managers at airports in a number of major cities, the head of F&B for the Olympics, and the list goes on and on…..
Can you tell us what is involved with training a chef at a restaurant and the staff? A combination of training of the disease of food allergies, Celiac and intolerances, best practices for front and back of house, policy and procedure assistance and emergency protocol. Ongoing training is also a major key to keeping folks trained and confident. Does your training cover cross contact? Yes there is a great deal of focus on cross contact. It is key to successful food prep, cooking, delivery and satisfaction. Do you suggest that restaurants and dining halls use separately colored utensils in the preparation of meals for food allergy and/or gluten free customers? We fully and completely promote this concept and encourage the use of separate colors for food allergies and Gluten-free. We use the same color for both of these special dietary needs, as the method to keep people safe is the same. That is also why we teach both in AllerTrain. The teaching and tools are the same and desperately needed for success. Do you provide ongoing training for a site and their employees? Or is it just a one time training? Ongoing training is addressed through the AllerSTAR program. Also many locations and universities have their staff go through AllerTrain once a year despite the fact the certificate is good for 5 years. They want to keep the information top of mind yearly. Thank you so much Betsy for creating this wonderful program to keep those with food allergy safe when dining out or in college! On December 28, 2016, the firm filed a complaint against American Airlines for targeting and discriminating against individuals with peanut and tree nut allergies in violation of the Air Carrier Access Act. This is very exciting! I’m very hopeful this will at least begin the process of having procedures and policies for food allergic travelers on airlines. Hello Mary. It’s wonderful to interview you today. Can you please tell us how you became involved in disability law, especially as it relates to food allergies and anaphylaxis? I’ve been a disability rights lawyer for almost two decades. I started my career at the National Association of the Deaf doing disability discrimination litigation. When my own child was diagnosed with food allergies and subsequently turned away from a summer camp because of his allergies, my worlds collided. 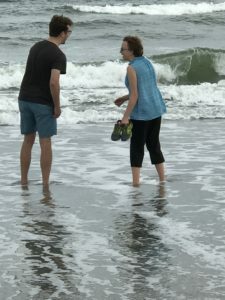 I found myself in the uniquely familiar position of advocating for inclusion but this time I was advocating for my son. I realized that if the child of a disability rights lawyer was denied access because of food allergies, there was work to be done. What food allergies does your family manage? I have three boys and only my youngest has food allergies – peanuts, tree nuts and shellfish. What lawsuit(s) have you litigated that pertain to food allergies and anaphylaxis? Stein & Vargas, LLP has a special interest in pursuing litigation that will create safe and equal access for people with food allergies. We’ve litigated a number of cases throughout the United States on behalf of people with food allergies who have experienced discrimination whether it be in employment, education, or access to programs and services. Among the complaints we have pending now are a complaint against Young Shakespeare Players East in which the United States Department of Justice has concluded that Young Shakespeare Players East discriminated against my 11 year old client on the basis of his food allergies and retaliated against my 13 year old client for advocating for her friend’s rights. We are also co-counseling on a case with Laurel Francoeur against Panera on behalf of a child who had an anaphylactic reaction after being served a grilled cheese sandwich that contained peanut butter despite notice that the sandwich was for a child with a peanut allergy. From your experience as an attorney, is there anything that a food allergy family should be aware of or take action on to ensure the safety and inclusion of their child in school? The most important aspect of safety and inclusion at school for food allergic kids is the development of a strong and positive relationship between the school and the parents. The focus cannot be on highlighting where plans failed, but on building long term trust and commitment. Even the most knowledgeable and well-meaning schools will fall down sometimes. You are a Co-Founder of Allergy Law Project. How did that come into being? Allergy Law Project was the brainchild of Laurel Francoeur who approached Homa Woodrum and I two years ago about the need for reliable legal information in the food allergy community. There is incredible power when parents of food allergic kids put their brains together for the good of the community. I love the blog post called “A Seat at the Table – Bringing Allergy Friendly Food to Restaurants“. You said that’s the question you are asked the most. What can a family do, in the moment, if a restaurant forbids them to bring in outside food? Is it necessary to bring along the state law to reference or is there some other statement that can be used to allow outside food? Generally, families can ask calmly and respectfully to speak with the manager. Explain to the manager that your party is looking forward to enjoying the food that the restaurant offers but your child cannot safely eat the food. If after calmly talking this through and explaining why it is necessary for your child to bring safe food in order for the rest of the dining part to eat at the restaurant the manager still refuses, you may need to go higher up the chain. You might send a politely worded letter to the restaurant owner to educate them about food allergies. Many food allergy families are concerned about Donald Trump’s comments about “streamlining” the Department of Education and curbing the role of the Office of Civil Rights. What can food allergy families do to protect their child and do you think that is likely to occur? I have grave concerns about the impact of the incoming administration on many aspects of the work we do. The Office of Civil Rights within the Department of Education, the Office of Civil Rights within the Department of Health and Human Services, and the Disability Rights Section all have a critical role in ensuring compliance with our federal rights. Significant cuts in staffing could jeopardize the ability of these agencies to safeguard rights and changes in philosophy could undermine enforcement actions throughout the United States. There is so much at risk and already resources are stretched tightly. I’m also concerned about the potential rollback of food safety regulations that has been threatened. My hope is that the allergy community has the potential to speak loudly and in concert to defend important rights. If someone reading this feels they need legal advice pertaining to a disability law question, how can they contact you? Stein & Vargas, LLP’s website is www.steinvargas.com. Folks are welcome to contact me with questions through the website. Ms. Vargas is committed to ensuring full and equal access for all individuals. She has litigated cases pursuant to the Americans with Disabilities Act and the Rehabilitation Act throughout the United States in federal and state courts. Ms. Vargas also represents women who are denied access to reproductive care and coverage. She has successfully obtained full coverage of late term abortion claims through insurance appeals. She also speaks nationally on issues including women in law, movement building, discrimination, pain, food allergies and anaphylaxis, and reproductive rights. Ms. Vargas is a co-founder of and blogger for the Allergy Law Project. 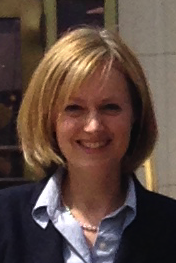 Prior to joining Stein & Vargas, LLP, Ms. Vargas was a staff attorney with the National Association of the Deaf. Ms. Vargas was a 1998 Skadden Fellow and a 1994 Truman Scholar. Ms. Vargas was the 2010 recipient of the Advocacy for People with Pain Award from the American Academy of Pain Management. She wrote for the American Bar Association, Mental and Physical Disability Law Reporter. Ms. Vargas obtained a B.S. in deaf education from the College of New Jersey, and a J.D. from the University of Connecticut, School of Law. While in law school, she was appointed to the Client Advocacy Board and served as student director of the Yale Law School, Advocacy for Persons with Disabilities Clinic. Ms. Vargas is a member of the bars in Connecticut and Maryland. She associates with local counsel around the country in bringing cases of special importance to individuals with disabilities. Planes are the trickiest for those of us with nut allergies. Airlines are not always friendly to nut allergies and it is up to the airline to determine their policy regarding peanuts and other nuts on the airline. You should do a quick Google search for your airline and nut allergies: for example, I’d search “Southwest nut allergies.” Most airlines will have their policies easily accessible on their website grouped in with their “Disability Accommodations” or similar. All of the airlines will have some kind of disclaimer that reads: “We cannot prevent passengers from bringing products containing nuts or other allergens onboard our flights. Therefore, we are unable to guarantee a nut- or allergen-free flight. Attempting to do this would create a false sense of security for passengers with severe allergies. We encourage passengers who are allergic to nuts to consult with their doctor regarding the safety of air travel.” It’s true that you’ll be stuck in a metal tube with limited ventilation for a few hours while flying and exposure to nuts in flight could cause serious issues, so you will want to consult with your doctor about the safety of air travel. However, this shouldn’t dissuade you from flying, especially because different airlines will have different policies regarding flying. They won’t serve nuts if they are given notice. Southwest is famous for their “Peanut Dust Allergy” document. You’ll mark that you have a disability – a “Peanut Dust Allergy” – when you book your flight online (or you can call Customer Service and they can do this too). When you get your boarding pass, you’ll also have a printed slip that says you have a peanut dust allergy. You present this to the service representative near your gate and they will give you an extra copy and a pre-board slip (see below) that you will give to the crewmember aboard your flight and they will not serve nuts on your flight. This doesn’t mean it will be a nut-free flight as other people could have nuts, but they will usually make an announcement asking passengers to refrain from eating nuts as well. They’re fantastic! Delta changed their policy a few years ago, so you just need to notify the crewmember that you have a peanut allergy and they won’t serve nuts. It’s very similar to Southwest’s policy, just more informal. They will allow you to pre-board to help wipe down seats. Southwest allows you to pre-board if you show you have a Peanut Dust Allergy document to the service desk next to your gate. Basically, this allows you to board before everyone else, find a safe seat, and clean your area before anyone else gets on your flight. I’d highly recommend this if you fly Southwest. They will give you a “buffer” zone. This seems to be the predominant policy from airlines that do accommodate allergies in some way. United, AirCanada, JetBlue, Alaska Air, and many other airlines will offer to create a buffer zone of one to three rows on either side of your row. The crewmember will ask all of the people in the buffer zone to not consume any nuts and they won’t serve nuts to those rows, if they serve nuts at all. JetBlue, WestJet, and AirCanda and a couple other airlines don’t serve nuts on their flights but will still offer a buffer zone to prevent other passengers from consuming nuts on the flight. This can be useful to help assure a safe surrounding. They won’t accommodate at all. American Airlines is rather infamous for this. They don’t serve peanut products, but they do offer warmed nuts for first class occupants and will not grant buffer zones or even allow you to pre-board to wipe down seats. Obviously, flying is the most complicated form of travel simply because different companies have different policies regarding food allergies. My best experiences flying have been with Southwest. I know other families have had great experiences with WestJet, JetBlue, and Air Canada as well, but I’ve always flown Southwest. The combination of a pre-board, no nuts served, and relatively inexpensive rates to most places in the country have served me well. There are a lot of online resources regarding traveling – just do a quick Google search and you’ll find a host of blogs and other resources to help you decide. 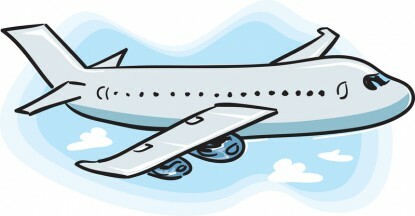 The airline is one of the most important considerations when you’re traveling as a group. It’s likely that your teacher or coach will be booking flights without regard to your food allergies or food allergy policies. You must tell them ahead of time if they’re booking on an airline that is not friendly to food allergies and explain why it’s important to have accommodations (at least a buffer zone) on a plane for your food allergies, if you have a nut allergy. 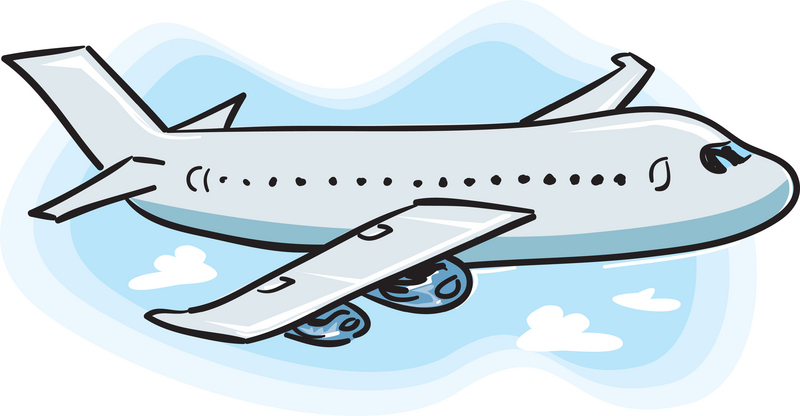 If your teacher or coach has already booked flights for the trip, you must decide whether you are comfortable flying the airline and have a thorough conversation with your teacher or coach about other ways you could get to your destination if you’re not comfortable flying the same airline. Recently, both my son, Morgan, and I have had interesting issues eating out at restaurants. I have been diagnosed with an eosinophilic disorder, which means that I make my own safe food and bring that to a restaurant when meeting friends. It would be wonderful to be able to eat food prepared by a chef, but currently that isn’t yet a possibility. I eat only organic foods, and I eat just 4 foods currently. It’s certainly not where I hope to be forever, but for now, it’s what my reality is. My husband and I met friends in Denver, CO at the Vesta Dipping Grill expecting a wonderful dining experience for the three of them ordering food. Their expectations were met; mine however was a little different. While the restaurant claims to be very accommodating to allergies, the assistant manager was less than thrilled with me bringing my own food. In fact, after everyone else’s food was served, he marched over to the table to tell me I was breaking the law! When he commented that if I brought in the food because of a medical condition that would be different. This is when my husband stepped in (I was crawling under the table at this point), and informed him that yes, it was a medical condition. At that point the manager told me that the next time I come in, I will need a doctor’s note to bring in my own food. This entire interaction took less than 5 minutes, and I was mortified. I have been bringing my own food into restaurants for literally the last 9 years. This is the first time I’ve had any restaurant employee even make a comment about the food, much less tell me that I’m a law breaker! I’ve searched high and low through all of Colorado’s Retail Food Establishment Rules and can find nothing that states, “no outside food allowed” in Colorado restaurants. The more interesting part of this story is that when I shared it with my son, Morgan, he told me about his experience with the same restaurant. He and a friend ate there a few months ago thinking they would be great with his peanut, tree nuts, sesame, fish and shellfish allergies with their 8 different allergy menus. Instead, his food was served with a dipping sauce filled with sesame seeds. This was after he meticulously discussed his food allergies and gave his Chef Card to the waiter. He is thankfully very careful about checking his food order when he receives it, and he noticed that his food was not safe. He said he will NEVER eat there again because of this mistake! Moral of the story – don’t trust a restaurant automatically that says they are allergy aware! Always check your food before taking a bite, and of course always carry your epinephrine. My husband, Robert, wrote an email to the owner of Vesta Dipping Grill, Josh Wolkon, explaining our disappointment and embarrassment with our dining experience. Josh followed up with a personal conversation with Robert outlining what they’ve done to change the dining experience for customers like myself who have to bring in food. They utilized our experience for a 2 hour training of all his restaurant employees in his 4 restaurants, and have developed a written, detailed plan for managing outside food brought in because of allergies. My husband also explained our son’s experience with the sesame seed in the dipping sauce. Josh was very disappointed in this major mistake, and said that this too will be utilized to better train his employees of the seriousness of food allergies. I’m very impressed that the owner of the restaurant would take his time to speak with my husband, AND to train his employees further. Additionally, we’ve been promised a gift certificate for a future dining experience, which I’m sure will be pleasurable! I recently traveled to New York – alone – for a conference put on by the Roosevelt Institute. As I’ve mentioned before, Roosevelt is a national organization trying to re-engage young people in the policymaking process. 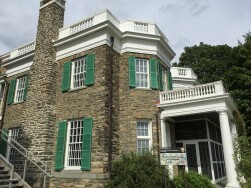 They offer a national training each year to leaders of the Institute from around the nation at Franklin D. Roosevelt’s home in Hyde Park, NY. Since I started my chapter of the Roosevelt Institute at the University of Denver, I was invited to attend! They offered to cover my flight out (which is great)! I had a great few e-mails with their operations specialist at Roosevelt and then I called and voiced my concerns about which airlines I could fly. Since I’ve really only had good experience with Southwest, I told them that I would prefer to fly with them. However, there was one main problem: I had to be at Grand Central Station in NYC by about 2:45pm on Thursday, August 6th to catch my train to Poughkeepsie, the nearest train stop in upstate New York. Only one flight from Denver would get me to LaGuardia airport at 1:40pm (landing time). I knew that it would be a tight push to get off the plane, get my luggage, and get to Grand Central in an hour. Instead, I had Roosevelt book a flight the day before. This allowed stress free traveling and some extra time. Since I didn’t book the trip online, I called in to Southwest customer service and explained my peanut allergy so that it would be noted on my reservation. The next problem was, where would I stay? My Mom and I had a couple discussions about friends and family we knew in NYC and in Poughkeepsie. We looked up a hotel in Poughkeepsie that was relatively cheap. However, we eventually settled on renting through Airbnb. If you’ve never used Airbnb, it’s wonderful! It is a website where home owners advertise a room or their entire place for you to stay in, like a hotel. Usually, however, you’ll have access to a full kitchen and all the amenities you may not have in a hotel. Plus, they must mark if smoking and/or pets are allowed. By default, they’re not! This makes the stay even better. 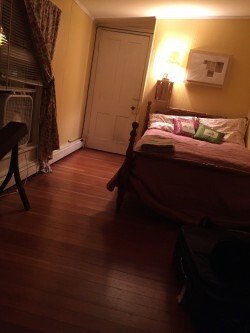 I found a very awesome room to rent in Poughkeepsie, NY. I submitted my request to room there for the night and had a great conversation with the owner through Airbnb before I went confirming the non-smoking and the no pets! I didn’t get into my food allergies since I knew I could find safe food. She and her boyfriend lived together; they were both lovely and fully accommodating. Roosevelt arranged housing for the duration of the conference at a nearby motel called the Golden Manor. I was supposed to have a roommate, but he didn’t show up. Instead, I got to have a room to myself! Now that I had my housing arranged, I had to make sure I had my food all in order. I coordinated again with the operations specialist at Roosevelt for a menu of the food provided at the conference. (I’m allergic to peanuts, tree nuts, sesame, fish and shellfish.) She got back to me and we realized that, in fact, all but one of the meals would be safe! She double checked with the caterers for ingredients and confirmed that all the meals (except one) would be perfectly safe. The lunch on Friday was Chinese, which was not safe for a multitude of reasons. Instead, they bought me a frozen meal that was perfectly safe (it was a burrito bowl and we both triple checked the ingredients) that I ate instead of the Chinese food. I also brought extra food for myself (a few homemade granola bars and a couple of bagels) just in case a breakfast or a lunch turned out not to be safe. That way, I always had something to eat! The trip itself went very smoothly. I arrived in NYC at LaGuardia airport, got my luggage, and hailed an Uber. Uber is another great app that allows you to hail a (more or less) private driver – like a taxi, but usually they’re nicer cars and nicer people – that will take you anywhere. The fee for the ride is all conducted through the app and tips are automatically added. It’s really a seamless experience and I had a great Uber driver on the way into New York City. The driver dropped me off with my luggage at Grand Central. I forgot how many people lived in New York City! Despite the masses, I found my way to a ticket booth, got my ticket, and got on the train to Poughkeepsie. It was about an hour and 45 minutes long. Once I arrived in Poughkeepsie, I walked the short walk to the Airbnb place and arrived home for the evening! Since the owners were out, they left a hidden key outside and let me know via the Airbnb app. Once they arrived back, we chatted for a while before we both went to bed. I had packed food for the trip and I ate along the way. In the morning, I had a granola bar and some coffee. A light breakfast, admittedly, but I kind of spaced on what I would do for that morning. Even with all of my careful planning, I did overlook it, but I was grateful I had brought extra food. After a while, I said goodbye to my wonderful hosts and walked back to the train station. Roosevelt promised to shuttle us from the train station up to Hyde Park, where FDR’s home is. The conference was absolutely amazing. 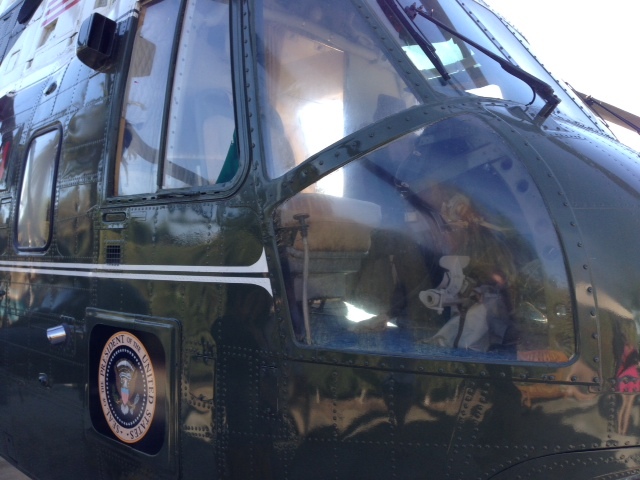 We got a tour of FDR’s home and presidential library (both of which were great!). We also did some great trainings for leadership, strategic planning, policy making, coalition building, and even PR techniques. The food went absolutely perfectly throughout the entire weekend and the staff were so wonderful! Every time I went to get food, the staff was double checking with me about the ingredients of the food and what I could eat. It was just wonderful. One night, a huge group of us walked 15 minutes up the road to a nearby diner. Just like any restaurant I go to in a foreign place, I played it safe and got some French toast. I double checked with the waiter and he double checked with the chef; everything went great. It was really tasty French toast, too! After the conference was over, I took a mid-morning train back to NYC from Poughkeepsie on Sunday, August 9th. Even though I had a small suitcase with me, I decided I wanted to look around NYC a little bit, so I ventured my way onto the metro and went down to the World Trade Center. 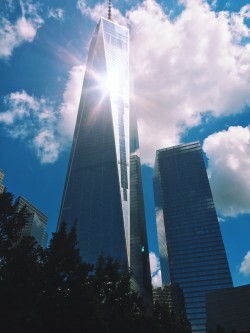 The memorial was absolutely gorgeous and the new One World Trade Center is great! I grabbed Panera for lunch before going to the airport via Uber. My safety for the entire trip was assured by planning ahead and making sure everything I was going to eat was safe. I just communicated my concerns and I made sure all of it would work! Overall, it was an amazing experience. Last Friday, I was in Denver meeting with a bunch of non-profits and elected officials for my most recent project: the University of Denver Roosevelt Institute. I’ve made mention of it before, but to recap, it’s an undergraduate non-partisan think tank. We’re a chapter of a national network of campuses that is attempting to re-engaging young people in politics (a tall order, I know). Anyway, I had a meeting with the Governor’s Senior Advisor, Jamie van-Leeuwen. Jamie advises the Governor of Colorado on social policy and projects (like homelessness) and has a wealth of experience in urban and economic development. He actually started his own international development foundation called the Global Livingston Institute. Needless to say, he’s very intelligent and was great to meet with him. He’s an absolutely whirlwind of energy – I swear this man never sleeps. Given that this was the only opportunity for me to meet with him in a month (he’s in Africa now working on projects related to his foundation), I figured if I had to talk to him on the way to a lunch (and at the lunch), I would. We basically raced to his car and started a short drive over to the Denver Center for the Performing Arts, where the lunch was being held. As it turns out, a celebration of culture for North & South America (called the Biennial of the Americas) was going on during last week and Jamie served on their board. Since this was the last lunch of the event, he needed to at least make an appearance. While I chatted him up on our car ride over, my mind was already thinking about the food at the event. I figured I would wait until we got there and see what they were serving. After a few brief hellos with people Jamie knew, we sat down at a table. There was a salad with spiced chicken on it and a vinaigrette already drizzled over it. Accompanying it was a chocolate cupcake with a nut-looking topping. As I sat down, a server came over and began to pour some water. I turned to her and immediately asked if the salad has any of my allergens. She tells me she will ask the chef and departs. Jamie and his friend we sat down with immediately turn to me and ask if everything is all right. They were very interested in my safety! I briefly explained that I had severe food allergies; they completely got it. The server returned and told me that everything in the salad was 100% okay. They did not prepare anything with shellfish, fish, or sesame. They aren’t a nut-free kitchen but the salad did not contain nuts. I felt very comfortable with that answer and began to dive into the salad. 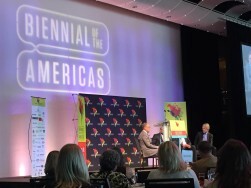 While the lunch was going on, there was a really great panel between the Mayors of Denver and Calgary, and a former Mayor of Bogota. They were talking about the importance of local community change. I always think about how important it is for parents of food allergic children to work with their schools and the school board on making sure food allergic children are safe in their schools. That’s a great example of what the Mayors were talking about. Without even asking, the server later returned and said the cupcake was topped with pumpkin seeds and not nuts, but cautioned me again that they weren’t a nut-free kitchen. I thanked her. As a general rule, I always pass on dessert simply because most desserts have some sort of cross contact issue with nuts, whether or not the topping is pumpkin seeds. Overall it was a great lunch and Jamie was awesome to talk to. I certainly wasn’t expecting to go to lunch, but everything turned out just fine! I always make sure to ask about the food served, especially at big galas. Who knows what’s in the food! My last high school-related adventure involved traveling to Kansas City for the National Speech & Debate Tournament, an event I had qualified to attend earlier this year. Before we left, I gave a health care plan to my Speech & Debate coach that explains procedure for an anaphylactic reaction, my allergies, and has an array of information on who to contact. I trained my friends/teammates on EpiPens as well. We left Sunday morning from Denver International Airport, flying Frontier to Kansas City. Frontier does serve food, but you have to pay for it (i.e. there are no complimentary drinks or food for most passengers). I asked the stewardess the moment I got on the plane if they served peanuts, and she replied, “You can certainly buy them.” I quickly assured her I wasn’t going to buy them due to a peanut allergy. Since the flying arrangements for this trip were made by the school, all six of us traveling to Kansas City got to sit together. This was important since peanuts could still be served on the flight to someone who was interested in buying them; that issue was mitigated since I was sitting with my friends. After arriving to the hotel, it was about 1:00pm (an hour ahead from Denver), and we were pretty hungry, so we walked across the street to Panera Bread. Panera is notable for its homemade bread that is mostly all cooked together. I talked with the manager about some safe options (it differs by store on how they cook their bread), and settled on a simple grilled cheese for lunch. I had a salad at Panera for dinner, probably the far safer option due to the possibility of cross contamination. Weighing the information given though, I decided that the grilled cheese was safe since it was not cooked with nut breads and they have rigorous cleaning procedures. 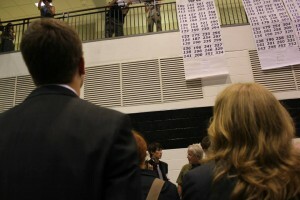 Speech & Debate tournaments occur in high schools, middle schools, and sometimes (at Nationals) in elementary schools. In Overland Park, Kansas (where we were), they had dozens of different schools for the thousands of competitors, each dedicated to a specific event (like solo debate or humorous interpretation). We had our coach and two parents joining us with rented cars so they could go and buy safe food for us. Breakfast was served at the hotel and there was a McDonalds across the parking lot for variety. I found out I could eat McDonald’s breakfast items after my California trip (read about it here). Lunch and dinner varied by days and locations (if we were at a different high school, we might eat something different). Chipotle – this was for dinner (I believe) Tuesday evening. It’s a safe option for me and it’s a chain restaurant, meaning most (if not all) of its locations serve the same thing. Applebee’s – another safe chain restaurant that was dinner the third night there. Jimmy John’s – an easy, safe option for lunch sandwiches. The team got Chick-Fil-A, but my coach made sure that I got a safe option for food, and made arrangements for Jimmy John’s (she’s the best coach, by the way). Potbelly Sandwiches – another option for lunch sandwiches. I hadn’t had Potbelly’s before, but I checked their website and called them up and talked with their manager about breads, sesame, and nuts. Everything was safe (besides their cookies) and it worked out great! Cinetopia’s Food Service – the last night we were in Kansas City, we went and saw a movie at the local movie theater. Unlike most, they have these “family rooms” with couches and reclining seats instead of the regular airpline-style seating. You also get to order food from their menu. I checked with the staff about their options and settled on another Mexican-style evening with nachos and a quesadilla. Jack Stack BBQ – the crown jewel of our food adventures, Jack Stack has some of the best BBQ in Kansas City (if not the country). Barbecue sauce can be especially dangerous since some restaurants use peanut butter as a thickener and/or nuts as a spice. Jack Stack uses neither in their homemade, exquisite BBQ sauce. I have to admit, that was the best food we had all week! Story of the Week: Due to its fame, Jack Stack’s is always pretty busy. Instead of dining in, we went over to their takeout side of the restaurant. While waiting for our food to be ready, we got in a nice conversation with a man who was picking up his own BBQ meal. Very genuine guy, who was interested in Speech & Debate and our interests. Right before leaving, he actually gave our coach $200 to spend on dinner for another night!! (We used it at the Cinetopia because, while their tickets aren’t that much more than normal, their food is abhorrently expensive). It was a very kind gesture. This was the longest trip that I’ve been through where we haven’t brought/planned food. I had combined a list of possibly safe restaurants before the trip began and sent it to my coach (it included Jimmy John’s, Jack Stack’s, Chipotle, and Applebee’s). That helped dictate a few choices, but we also got recommendations from the locals (for El Fogon and the Kolache Factory, for instance). Always talk to someone in charge. Servers are knowledgeable about the menu, not how the food is prepared. Find a manager or the owner or the chef and talk to them about food preparation and the process of cooking food. Also talk with them about ingredients. Try and eat at “safe-cuisine” restaurants. Typically, Mexican cuisine is safer than, say, Asian cuisine for me (not only due to the use of shellfish & fish in Asian cuisine, but nuts as well). I’d automatically feel safer at a Mexican-style restaurant than an Asian-style restaurant. Call ahead, if possible. Don’t waste your time at restaurants that aren’t safe. Call ahead and talk to someone in charge about food. If it turns out the restaurant is not safe, you didn’t waste your time and you can find another safe option. There is always a risk. It’s really unavoidable – there is always a risk involved in eating new food. I ate at more new restaurants during Nationals than I had in the past 5 years combined! However, I felt safe and comfortable doing so. The two-minute rule. That being said, I’m still cautious! This is a personal thing that I do: when I try food at a new restaurant, I take a small bite and wait two minutes before eating anything more. From my previous experience with anaphylaxis, my first symptoms occurred within the first two minutes after eating fish. I cautiously eat a second bite after the first two minutes and wait a little while longer. If nothing happens, I eat my meal entirely. If something does happen, I would immediately tell someone about it. Nationals was one of the best experiences I have had – not only due to the intelligent and humorous people at the event, but also the safe food that was readily available. I also broke to Top 80 at Nationals in Lincoln-Douglas debate, a solo debate centered around values & ethics. If you would like to view the National Tournament Highlight Video (published by the National Speech & Debate Association), click here. I make a cameo appearance at :49 (I’m in the background looking up. The camera isn’t focused on me). Plus, there’s a great music video at the end of it. Remembering to Bring Your EpiPen/Auvi-Q ALWAYS!! If your child has food allergies, it is vital that they begin, at a young age, to remember to bring their epinephrine autoinjector everywhere! I had a conversation recently with a Food Allergy Mom whose 18 year old son is no longer remembering to bring his EpiPen with him when he leaves the house. She asked me what could she do? It brought up an interesting conversation about food allergies, safety and teenager’s brains. 2. Our family has specific safety rules. One of those rules is that he always carries his EpiPen on his person. We also have rules that require him to wear a helmet when biking, and wear a seat belt when riding in a car. If you stick with these rules, it’s easier for it to become a habit. 3. Morgan started carrying his EpiPen in a fanny pack when he was 4 years old. He got accustomed to being responsible for it. He wasn’t allowed to carry it at school until he was in 5th grade per the Colorado law. Once he was allowed to wear it in school, we checked each day that he had it on his belt loop. For a while he carried one EpiPen in a flashlight holder on his belt. Now, he carries two EpiPens in a Garmin GPS pack inside his pants pocket. 4. Morgan developed a system of stacking the items he needs each day. He stacks his cell phone, wallet and EpiPen pack on his desk so he always knows where they are when he’s preparing to leave the house. 5. We were willing to turn around and go home to pick up his EpiPens should they have been forgotten. That showed him how important they are. Also, when he first began to travel with his Speech/Debate team, I would ask for a gift: please show me that you have your EpiPens. It allowed me to stay a little calmer knowing that regardless of what occurred during his trip – at least he had his EpiPens! 6. My husband and I recognize that forgetting things is part of the teenage brain. He isn’t mature enough to realize the consequences of his actions. Therefore, it’s our job as parents to not allow him to engage in such risky activities where the consequence for his action far outweighs the oversight. In other words, if Morgan is caught speeding while driving, he will get a ticket. That is a reasonable consequence. If he forget his EpiPen, that could have life altering consequences. That’s too much of a consequence for a seemingly mild oversight. If Morgan wasn’t willing to carry his EpiPen, or was consistently/purposefully forgetting them, we would curtail his activities until he could prove he was responsible enough to properly care for himself. As Morgan prepares to go to college, we have asked him to be completely responsible for all of his medications. Remembering to take his asthma medications daily will be vital for him to remain healthy at school. We still have about 6 more months to ingrain this in him! It is a process, but when moving out is tied to performing certain responsibilities, it’s amazing how remembering medications can become a priority. Hello everyone! 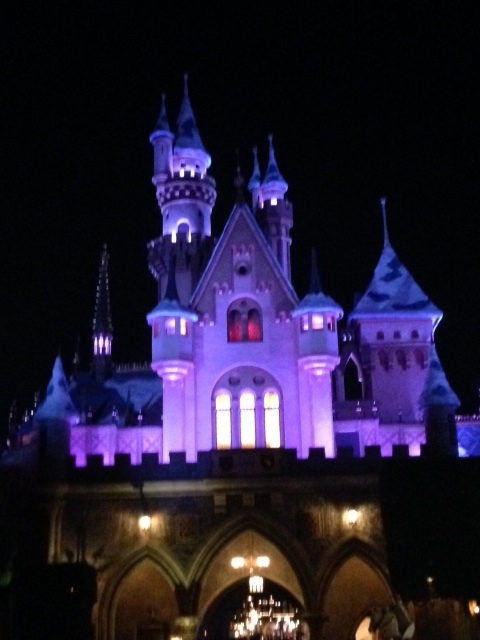 I decided to update all of you with just one post covering both days given that a good portion of one was in Disneyland. 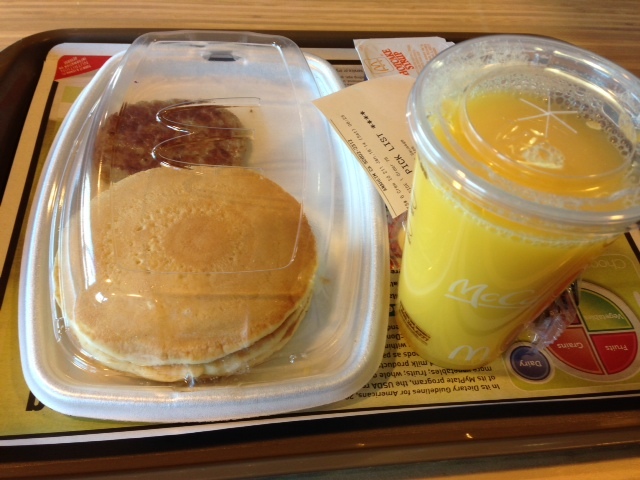 There is a McDonalds in the vicinity of the hotel, which makes getting breakfast easy. When planning, I was very surprised to find out that none of the foods that McDonalds serves at breakfast contain nuts (or any of my allergies). I simply got pancakes and sausage and while it may not have been the most healthy breakfast, it certainly tasted good!! After breakfast, my whole group went out to the President Nixon Library and Museum. It was a phenomenal experience!! I got to see the old Marine/Army 1 (depending on the branch of the pilot) that President Nixon departed from his presidency in. 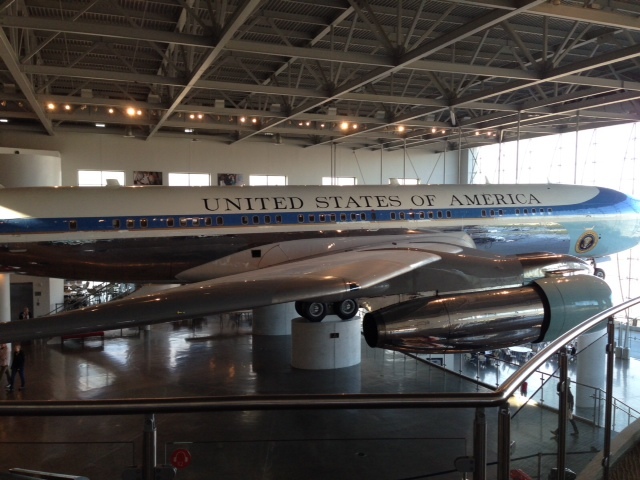 I also had the chance to learn all about President Nixon’s life and successes. No food was allowed in the museum, so I didn’t have any problems. 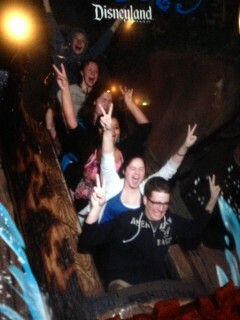 After the Nixon museum, our group went to Disneyland! We were there from 1pm until midnight. I can say that I haven’t had that much fun in a very long time. Food at Disney wasn’t hard at all. I stopped by and had some food at a Sandwich joint for lunch and balanced out some safe BBQ for dinner. I had simply asked about the sauce they use for their BBQ – they graciously provided ingredients for all of it. It was absolutely delicious! Food is always a big issue when you’re at a theme park. But, what about carrying around your cell phone and EpiPens? If there is ever a problem, people need to be notified. I carried my EpiPens, cell phone, and wallet on me at all times. I didn’t leave them in a bag or put them in a locker. Splash Mountain certainly made me a little wet, but my cell phone was fine and my EpiPens were stored in a Garmin case and remained in their waterproof case, as always. I was thoroughly exhausted by midnight. It was a fun day – I even got to see the whole castle lit up! 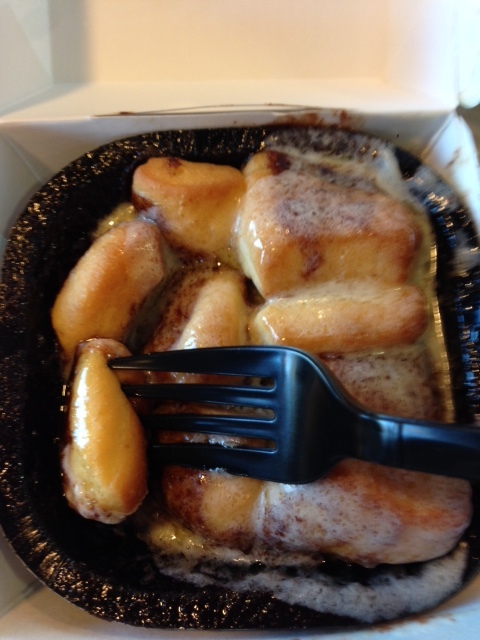 I once again had breakfast (and included a delicious and completely unhealthy cinnamon melt) at McDonalds. We visited the Museum of Tolerance. No pictures were allowed, so I can’t document anything from the museum, but I can say it was one of the best museums I have ever visited. It was enlightening and heavy, examining the consequences of our words and propaganda against another group of people. It specifically looked at the Holocaust, and I nearly came out in tears from one of the gas chambers. 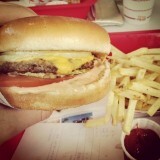 After the Museum of Tolerance, we went to In-N-Out burger. I have never eaten such a good burger. And fries. And milkshake. It was amazing fast food. Fast food burger joints are nefarious for their use of sesame seeds on buns. 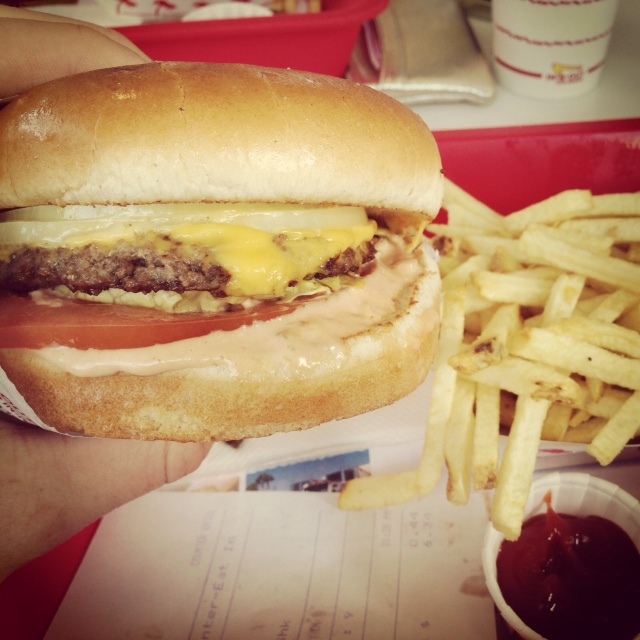 I had called ahead to the restaurant chain to make sure they didn’t use sesame on their buns – they didn’t. Their fries are also not cooked in peanut or sesame oil – another wonderful and tasty victory! After In-N-Out, we visited President Reagan’s library and museum. That was an another awesome experience! 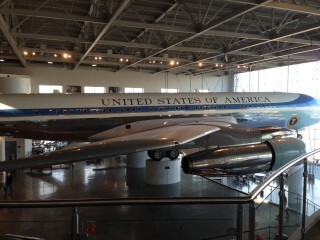 We got to revisit Reagan’s life and successes along with the old Air Force One. That took the rest of the afternoon. For dinner, we got to eat at restaurants in the vicinity of our hotel. I had checked before the trip, and there was an IHOP just down the block. IHOP is what I call a “pocket” restaurant – it’s always safe and I can just pull it out of my pocket as a safe backup. I’ll post a final update tomorrow after my flight home! I’ll leave you with this awesome California sunset taken from President Reagan’s library. To read Morgan’s other post about his Senior Class Trip on Friday, click here. Hello everyone! I figured I would do a few updates throughout the trip just to keep all of you apprised with the day to day happenings. With traveling, I believe planning is one of the most important things you can do. Before leaving, I charted out all the locations my group was going to and located safe places to eat. The teacher in charge is super detail oriented, so the itinerary we received was very detailed with times and locations. After calling the different places, including In-n-Out Burger, Rainforest Cafe, and a local pizzeria, I had my entire menu for the trip planned! As a note, the Rainforest cafe (and two other meals) take place inside Disneyland. Disney is renown for their ability to take care of food allergic children. I also created a list of everything I would need to bring, including medications. This way, I make sure I have everything I’ll need (mind you, this trip is only 4 days so it wasn’t an extensive list). For TSA, I removed ALL the liquid medications (like eye drops and nasal spray) and put them in the bag with my other liquids. This ensures I won’t hold up the line. I also always wear my MedicAlert bracelet, but that’s never been a problem with metal detectors. It never sets it off. I do remove my EpiPens in my pocket and set them in the bin to have them scanned. Above is my boarding pass. When I fly Southwest, I typically have “PDA” printed on my boarding pass, which means “Peanut Dust Allergy.” This means that I can preboard the plane and wipe down the surrounding areas. (It also means I get to choose the best seats!) Thankfully, United doesn’t serve peanuts on their flights, so it wasn’t a problem for this trip. I did bring a few snacks for the plane ride – NutriGrain bars, apple slices, and banana bread from home. If I were thirsty, I would have bought a soda near the gate for the flight. The flight went excellently. There were no problems and I sat among friends so no one ate nuts. After the flight, we immediately went to the beach! It was a great time. For lunch, I had pizza from a local pizzeria that I had checked with beforehand. It was delicious! I then went and played at the beach with friends for a few hours. There was a shellfish shop or two along the beach, but obviously I didn’t eat at them (nor my friends)! 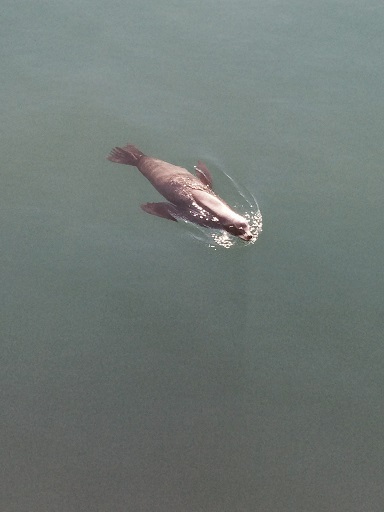 We also met a seal (pictured above). After the beach, we returned to the hotel to change and then went to dinner at Rainforest Cafe in Downtown Disney. I had called ahead and checked their menu to make sure there was a possibility for safe food. When I arrived at Rainforest Cafe, I let the server know I had severe allergies right after I ordered my drink. She was super kind and immediately brought out the kitchen manager – a sort of combination between chef and manager. He asked what my food allergies were, took them down, wrote down my meal, and then specially prepared it (he even served it to me)! 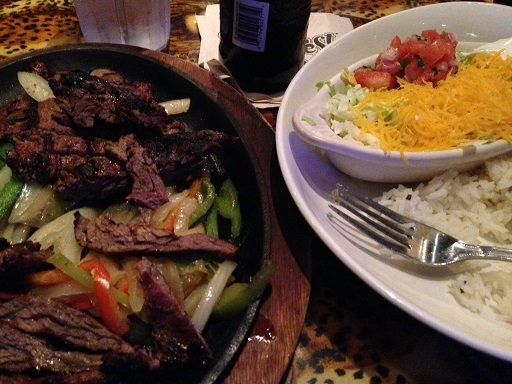 The steak fajitas were delicious. It was a wonderful Friday!! I’ll keep you updated about Saturday with journeys including Disneyland!! To read Morgan’s post about his Senior Class Trip for the rest of the trip, click here. The Senior Class Trip to Southern California is upon us! How do you help your teenager to manage their food allergies on a weekend trip? The better question might be – how do you help yourself manage your fear and anxiety while your teenager is on a weekend trip with the Senior Class?! We’ve had years to prepare for such a trip, but now that the trip is this weekend – all that planning is followed by still more preparations to ensure Morgan’s safety. He’s very aware of what his food allergies are – peanuts, tree nuts, sesame, fish and shellfish – and he ALWAYS carries two EpiPens and a Chef Card for restaurants. He’s had a lot of practice eating out with his Forensics team; and he’s been on plenty of trips with our family and once to the Boy Scout National Jamboree with his Dad along for several days of that trip. This will be the first trip that he’s entirely on his own from start to finish. He’s almost 18 years old, so it’s probably time! Morgan and I got all his trip paperwork completed by our allergist to allow him to take his medications with him and to carry his EpiPen and inhaler. Additionally, he has to take other meds for his asthma and environmental allergies. He been the manager of those meds recently, ensuring that he takes them every night. That feels good to have turned those over to him. Our allergist signed off on a Health Care Plan for the trip that included what to do if Morgan goes into anaphylaxis. The chaperones on the trip, all teachers, have only been trained to call 911 after giving an EpiPen. If Morgan were to need to go to the ER in Southern California, someone will need to go with him in the ambulance AND someone will need to stay with him in the ER for 4-6 hours to ensure no biphasic reaction occurs. Morgan and I made a presentation to his chaperones last week at school to ensure they knew all the steps necessary to keep him safe. The teachers were so appreciative to know about the details of his food allergies, since they had a student last year experience a seizure on the trip and they had no medical information about the issue from the family. Thankfully, the coordinator of the trip, the AP Government teacher, is VERY detailed. She has prepared an itinerary for the trip that includes the times and locations of every activity. This has allowed Morgan to look up the restaurants on the Internet, and to call the hotel to ensure that he can obtain a safe meal for breakfast. On the days when they will be able to eat at Disneyland, for example, or at any restaurant near the hotel, he’s had to do more research on the locations of the restaurants and their menus. I’ve had to communicate my need to know specifically what he’s going to eat and that he’s got a plan. Just saying, “I’ll handle it” doesn’t make Mom feel good! Morgan is flying United Airlines which doesn’t serve peanuts. I plan on sending him with wet wipes so that he can wipe down his environment on the plane, which we always do when we fly. He’s trained many of his friends about allergic reactions and administering his EpiPen. He will bring EpiPen trainers to do so again. We’ve found that teenagers love to be trained and to practice with the trainers. Some scoundrels like to administer the trainer on their forehead, but I know the message is still getting through! All of the students will be housed four to a room, boys with boys and girls with girls. The teacher in charge has already insured that Morgan knows all of his roommates and feels comfortable asking them to not bring any of his allergens into their room. Even if Morgan didn’t know them as well as he does, I feel sure he would be able to advocate for himself and have a safety zone in the room. As for Mom…I will be sending him off with lots of love…and lots of instructions too: Make sure to take pictures and especially make sure to HAVE FUN!! 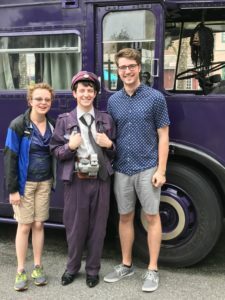 To read Morgan’s two posts about his Senior Class Trip – read them here and here. When our now 17 year old son, Morgan, was very young, I never signed him up for day camps, and I never allowed him to sleep overnight at a camp for fear of the food involved. As he aged, he began to want to participate in these activities. He also had more of an ability to monitor the food and to determine if an activity was safe for him as he got older. Day camps frequently are run by volunteers and/or high school age kids in our area. These types of camps include art lessons, church camps, Cub Scout day camp and music camps. We have found this to be a hazardous situation in most cases unless my husband or I participate. There are many wonderful activities in which to participate during a 4-hour or 8-hour day camp, however most volunteers are unaware of how to manage children with severe food allergies and possible allergic reactions. And during that time period, lunch or snacks will inevitably be served. 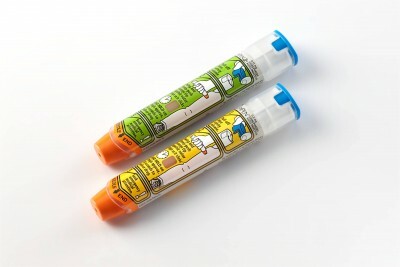 Having the ability to explain food allergies the day one arrives at a camp and teach every adult how to administer an EpiPen® isn’t likely to occur. We’ve found it virtually impossible to prepare in advance for these day camps, since the volunteers show up only on the very day of the event. We therefore participated as Den Leaders for Cub Scouts, or as an adult volunteer with any of these activities. That afforded us the opportunity to monitor the food, which allowed our son to be a participant. Day camps hosted by a local school district or college have been very positive for us. I have completed the necessary paperwork to sign Morgan up for camp adding a copy of his Health Care Plan and 504 Plan and asking that the person in charge contact me. Then, I have gone to the location to train one or numerous individuals how to operate his EpiPen® prior to the first day of class. We’ve then had the opportunity to discuss necessary accommodations, and what to do in case of emergency. Morgan has participated in numerous of these types of camps, and has never had an allergic reaction. I think the difference between these day camps and the previously mentioned ones is that there is a qualified teacher in charge! As Morgan aged, day camps geared toward a sport such as golf have proven to work well. One of the reasons this did work so well is that the golf pro and assistants never changed. We could train all of them how to use the EpiPen® on the first day of camp, and feel comfortable that no new faces would be teaching golf by the end of the week. One summer, Morgan volunteered as a swim instructor at a local pool. He was in the water for 1 ½ hours per day with the 3-6 year old kids helping them learn to swim. There wasn’t any issue with food at all, since there’s no food in the water! We do choose his activities carefully, yet as a teenager he’s so much more able to monitor the food that does appear. In regard to overnight camps, we’ve had very good luck. My son has gone for a week to the local YMCA camp and for a week to a Boy Scout Camp with much preparation beforehand. 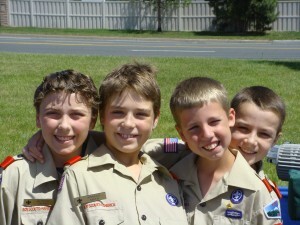 He even attended the Boy Scout National Jamboree in the summer of 2010 for a total of 17 days! These camps are more likely to have medical personnel on staff, and are manned by paid employees. There are medical forms to be completed prior to camp. We can list all his food allergies and the daily medications required to keep him properly medicated. We specifically include EVERY medication that he might need or will need during camp, and we send all of those with him with a written explanation of doses and possible reactions. Our son has to remember to go to the nurse’s station to receive the medication, and he is old enough and responsible enough to do such. If your child is likely to forget their medication, some camps are better than others in reminding campers to take their meds. A really good camp will have a system for kids to be reminded without unnecessarily drawing attention to them. The YMCA camp called it the “Secret Service” which was the cue for all kids who needed to take meds to head to the nurse’s office. This was a very nice way to keep medications discreet and keep campers properly medicated. To prepare for overnight camp, I spoke with the EMT in charge of the YMCA camp a month prior to my son’s arrival. I described the medicines he would be bringing, and that he would also bring his own food. The EMT assured me that every camp counselor would know of my son’s allergies and also that they were all taught how to administer an EpiPen® should the need arise. They served peanut butter only to those children who wouldn’t eat anything else, and it was carefully monitored at a separate table. My son had friends from school joining him for the week at camp who all understood his food allergies and all knew that no peanut butter could be eaten near him. They were a wonderful support, and exclaimed that the food brought from home looked better than the camp food! Before choosing an overnight camp for your child, make sure that you and he/she are ready to take on this big step! Food allergies add that extra amount of precaution and potential worry that other first time campers don’t have to experience. It’s hard enough to sleep away from home for the first time, so worrying about food allergic reactions shouldn’t be part of any potential upset. Morgan was ready to handle any situation that arose, and knew the safe adults he could speak with should a reaction occur. Earlier this summer, Morgan stayed at Colorado State University in Pueblo for Boys State, a week long summer camp about government. He initiated the calls to the Camp Director and spoke with the Nurse on staff prior to going to camp about his medications and their awareness of anaphylaxis. He also called the Chef on duty to speak with her about the possibility of safe food. I listened in on that phone call just to ensure that everything from cross contamination to ingredient listings was covered. For the first time ever, he was able to eat the camp food! The President of the University has Celiac Disease and the awareness of the kitchen staff was amazing about food allergies. Morgan learned the right questions to ask, and how to prepare for camp – a skill he will need for the future! Since our family has never been to Europe, I wanted to interview someone in the food allergy world who has and had a great experience! Julie Trone is the CEO of Allergy Free Table, LLC. She has two pocket guide style books on food allergy management. Together with her husband, John, they have created many new resources for families and teachers who manage food allergies. She loves to travel with her husband and twin boys; (one of her boys has multiple food allergies and both have asthma), ski, hike and practice yoga. What food allergies do you manage in your twin sons and what is their age? We currently manage peanut, tree nut, dairy, sesame, and sunflower. Only one of our sons has food allergies. . The boys are 10 years old, soon to be 11. How did Allergy Free Table come into existence? About five years ago a neighbor had a 9 month old daughter who was diagnosed with severe multiple food allergies. After advising her on food allergy management she asked if I would write a book with her on the subject. I was very interested and came up with the concept of a pocket guide that was a quick reference guide for parents. Eventually the torch was passed to me to take over the project. This project led me to developing the pocket guide for educators with another friend, Maria Acebal. 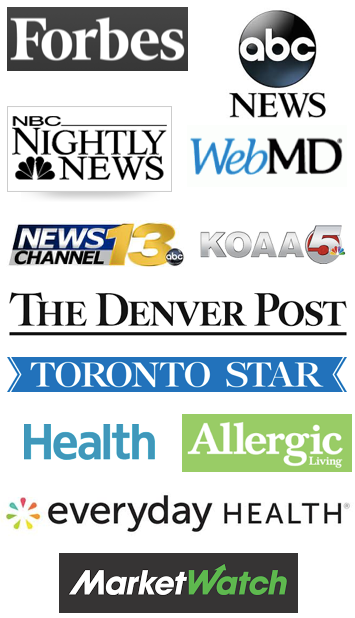 Allergy Free Table is the result of these publications coming to fruition and recognizing the need for practical educational resources on this subject. You recently went with your family to Europe and England. What airline did you choose to take and why? We chose Iceland Air for a few reasons. We all wanted to set foot in Iceland because it is a fascinating island with a unique culture. Iceland Air had the dates, airport locations, and price range we desired as well. We discussed our food allergy needs with a customer service representative upon booking who notated our record but it was not the reason we chose the airline. Even with the notation in place we were unsure how they would actually handle food allergy management until we were seated on the aircraft. We prepared for our flight by packing in our carry-on bag multiple packs of EpiPens and plenty of antihistamine. Our son packed his backpack with sandwiches and snacks to last the entire 10 hours of travel time. Neither the check-in nor boarding gate attendants were aware of the allergy notation and asked us to talk with the flight crew. I was concerned until the gate attendant flagged down the flight crew before they boarded. The flight crew had known about the notation then discussed their food allergy management protocol with us. They made sure they knew who Gavin was, where he was sitting, and that he was not in an aisle seat in order to avoid the possibility of cross contact. After the safety announcement, a food allergy announcement was made in three languages asking passengers to refrain from eating any nut products. They did not allow the sale of their trail mix snack and checked on him periodically. On our return flight I overheard a passenger order the trail mix and the attendant told him that it could not be purchased due to a passenger with nut allergies on board. Can you tell us about managing food allergies in the various countries? Were some countries easier than others? We toured Italy, France, and England. Food is such an important part of the culture in each of these countries and varies by region. The food that is native to the region is generally served more often in restaurants and abundant in grocery stores. For example; Fontina cheese is made in the Italian Alps where it can be purchased in most markets, cheese shops, and restaurants. Prior to our trip we researched the location of grocery chain stores, hospitals, and pharmacies. On our first night we stayed in Dijon, France and knew there was a large grocer in town, ‘Carrefours’. Since we were traveling by car and had GPS we were able to find the store to shop. Travelers who use public transportation may want to research what means of public transport will take them to the grocer. Travelers will find small local markets with fresh produce, eggs, bread, and meat within walking distance in cities and small towns. The local markets may or may not have GF foods like pasta and bread but carry fresh, local foods and limited packaged food. Dairy products are very common in Great Britain, France, and Italy however we found safe breads, pastas, meats, and fish for our son. France was the most difficult country in terms of finding allergen safe restaurants and packaged foods. When we would find a safe product we would stock up. Since we had a car it was not too difficult. In Paris we did not have a car so our son ate a lot of safe cereal and slices of ham during our stay there. In England packaged foods have the most informative labels I have ever seen. It was quite refreshing. Still, we followed our set rule; if you cannot read it don’t eat it (pertaining to food packaging labels). Being in an English speaking country was easier however we maintained the same protocol…read the labels each and every time, ask questions, and if uncomfortable trying a food say ‘no thank you’. Did you go out to eat often? What did you find to be difficult to manage? We ate out two to three times a week for dinner and lunch. When we would ‘shop’ for a safe restaurant we would take the language barrier and ability to understand our needs into account. We rejected quite a few restaurants and frequented those that were safe. Eating out was not very difficult as long as we were carrying safe snacks and at least two sandwiches for our son to eat just in case. He usually ate all of the safe foods we packed and found something safe to eat (like the ham in France) at a restaurant. Last resort for travelers is to go to an American chain like Burger King or McDonalds; we successfully avoided these restaurants. Where did you stay – a hotel or a condo with a kitchen? Mostly we stayed in week-long rental units with kitchens. The day we arrived at any new location we would unpack then head to the grocery store to stock up on safe foods. In France we stayed in hotels; it was challenging. London was a great place to stay with many grocers nearby including ‘Whole Foods’ in the Kensington area. What can you suggest to our readers who want to take their child overseas? Is there an age of child(ren) you believe works better? We discovered that the most important task to managing food allergies in countries where the primary language is not English is to prepare in advance. Order chef cards and emergency care cards in foreign languages; we purchased French and Italian cards. I brushed up on my foreign language skills and was considered the family translator. We also made a list of many words translated in French and Italian so we could read labels. Other important words to translate are; medical assistance needed, where is the pharmacy, call a doctor, this is an emergency, and take me to the hospital. It is important to learn about medical services available, proximity of the nearest hospital, and program the local emergency number (like our 9-1-1) into your cell phone. Carry emergency medication with you always. Even English speaking countries have a different dialect, vocabulary, and emergency number. Packing is also a key factor. We packed 2 jars of chocolate soy butter to last the trip and luckily it did. I highly recommend packing the following; plastic container, a few zip lock plastic bags, one cloth grocery bag, plastic cutlery, and a few staple foods. It is important to educate your child before the trip about food choices, what will not be available, and what to expect. We taught our sons that we were all going to find ‘different’ foods, some similar foods, and mostly to be prepared to try new safe foods. They knew some sacrifices were necessary. For instance our son never found a safe dessert, not even popsicles, so when we found Skittles he was allowed to have them. After 7 weeks he was tired of Skittles but had a great story to tell about how many Skittles he was allowed to have. I believe parents can bring their children to Europe at any age however the management will be different and possibly more demanding for smaller children. Our 10 year old sons were great travelers. Their maturity level was perfect for our long vacation abroad (50 days). We are proud of our son with food allergies who was very interested in learning how to read a label in French and Italian as well as participate in ordering safe foods, asking questions, and being careful about choices. He never complained about his food choices so I guess we did a good job preparing him and he was comfortable being flexible. We always had at least two sandwiches with us each day. Every child is unique so it is not safe to assume your child is a natural traveler, especially children with medical needs. Preparation is key! Focus on the fun, art, history, sport, cultural attributes …anything but food. It worked beautifully for us. If someone has more questions have them contact me, julie@allergyfreetable.com . Born and raised in Plano, Texas, Kenton discovered his love for acting in the fourth grade when he landed supporting roles in the Dallas Theater Center’s rendition of A Christmas Carole. It was such an amazing experience for Kenton! He loved being on stage and got great joy from entertaining the audience. The show did thirty-five performances between Thanksgiving and Christmas Eve, and Kenton relished every single one. He followed that with a lead role in the production of Ragtime. The production was seen through the eyes of his character! The following year, Kenton was asked by his agent in Los Angeles to give California a try. Kenton Duty can currently be seen as one of the stars on Disney Channel’s hit series “Shake It Up” as the hilarious character of “Gunther.” Most recently, Kenton wrapped production in a lead role in the indie film Contest (2013). The movie is a story about standing up to bullying. Kenton is also writing and recording a song for the movie. Kenton, thank you for ‘speaking’ with me at AllergicChild.com. Can you please tell us how old you are and what food allergies you manage? I am 17 years old. I have a chocolate allergy and a wheat allergy. I outgrew my dairy allergy when I was younger. Have you ever experienced anaphylaxis or been to the ER with an allergic reaction? I have never been to the ER or experienced anaphylaxis due to my food allergies. I have had to go to the doctor several times. Do you carry an EpiPen? How do you carry it? I carry an EpiPen with me at all times. I carry it in my backpack. It is extremely important to have it with you at all times. You do not know when you might need it. I really like to think that it is just another item I carry around like my phone, iPad, sunglasses, etc! With all your traveling, how do you manage your food allergies to stay safe? I do several things to make eating a safe, but enjoyable time. I pack or ship my food to the various locations. I also bring my food on airplanes. At some restaurants, it is easy to ask them to prepare my sandwich on the bread I brought in versus their bread. I definitely explain to restaurants what my allergies are. What is done for you at Disney and on movie sets to keep you safe? I saw in a recent FAAN newsletter that you went to Capitol Hill to encourage the US Congress to support the School Access to Emergency Epinephrine Act. Can you tell us about this? What was the best part of this experience? Oh my goodness! It was amazing. 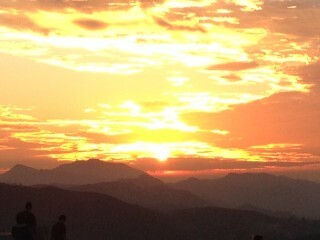 To be there with FAAN was so much of an honor. I enjoyed every second of the day having the opportunity to speak with congressmen and senators about how important it is to pass this legislation. I believe in the Act 200%, and I wanted to convey my thoughts as someone who carries an epinephrine auto injector, is a student in school, and can relate to the situations where an auto injector may not be available at the critical time in which it is needed. The individuals we were able to meet with were very nice, and I walked away hoping they were a little more enlightened by our meetings. Do you have any advice for younger kids who manage food allergies? I know that you can possibly be bullied or made fun of because of your allergies. I have definitely experienced those things. I like to encourage kids to not feel weird or different because you have allergies. It is hard, but if someone is not being nice or bullying you, let your parents or teachers know. You do not want to let it get out of hand. One of the lessons we are hoping kids learn in the movie I am currently filming, “Contest”, is that they can stand up to bullies. I also encourage kids to not eat anything their parents have not let them know is safe. Whoever cooked the item may have used different ingredients than what you are used to having in the product. So, always check with your parents! I definitely want to encourage kids to carry their epinephrine auto injectors with them. It is just another thing to have in your backpack! And, it will save your live. I appreciate you asking me to share in your newsletter. Your newsletter is very informative and educational. The more aware of food allergies we can make society, the more safe it will be for those of us living with food allergies! !